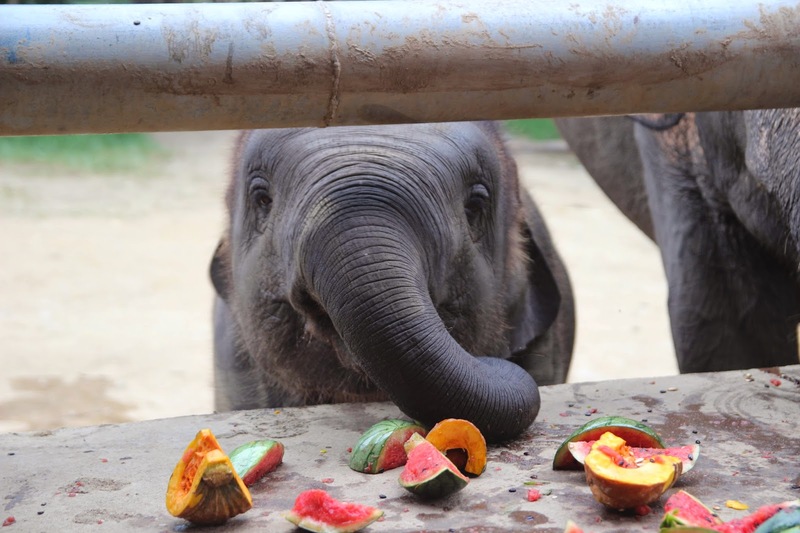 One afternoon, as we sat on the pavilion watching the elephants come by for their regular snack time of watermelons, baby Navaan stormed around the corner, stomping, trumpeting, as if to say, "I want my watermelon... now!!!" His mom and auntie didn't seem too concerned by his behavior, and calmly moved into position to be served their afternoon treat. 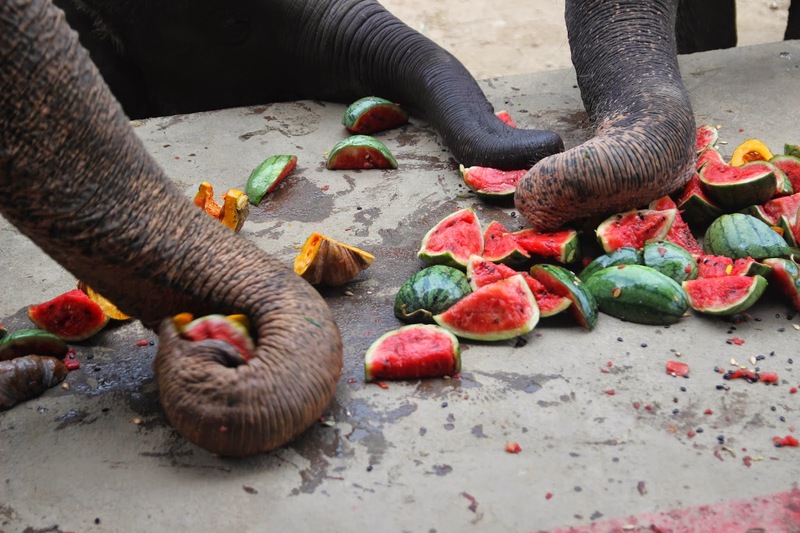 As soon as the bits of melon were emptied out onto the pavilion, Navaan dashed over, eagerly scooping the treats into his mouth with his tiny trunk, forgetting his earlier tantrum, and stealing as many bits from mom and auntie as he could. 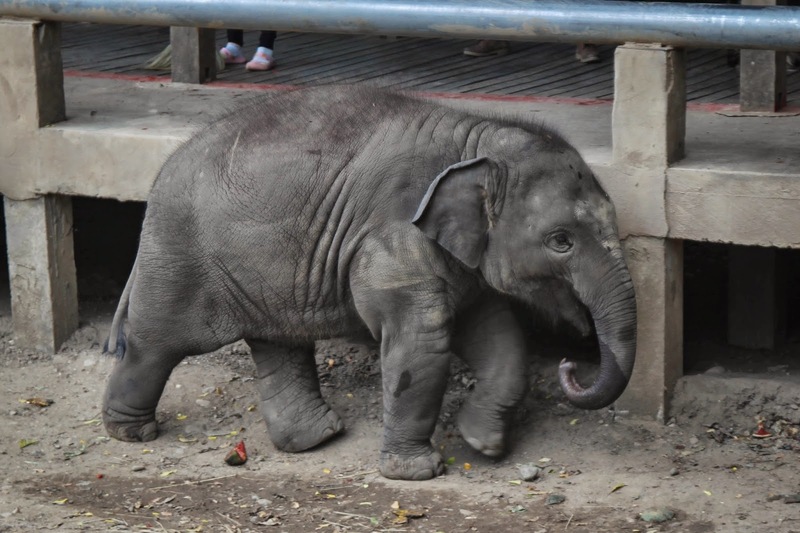 We all smiled and watched him, amazed that we could have this experience - watching this pure, innocent display of personality from a precocious baby elephant, knowing we wouldn't have such a chance anywhere else. Another morning, I spotted a regular trio of ladies slowly crossing the park. One is very slow moving from a poorly healed broken hip, and her two friends look out for her. 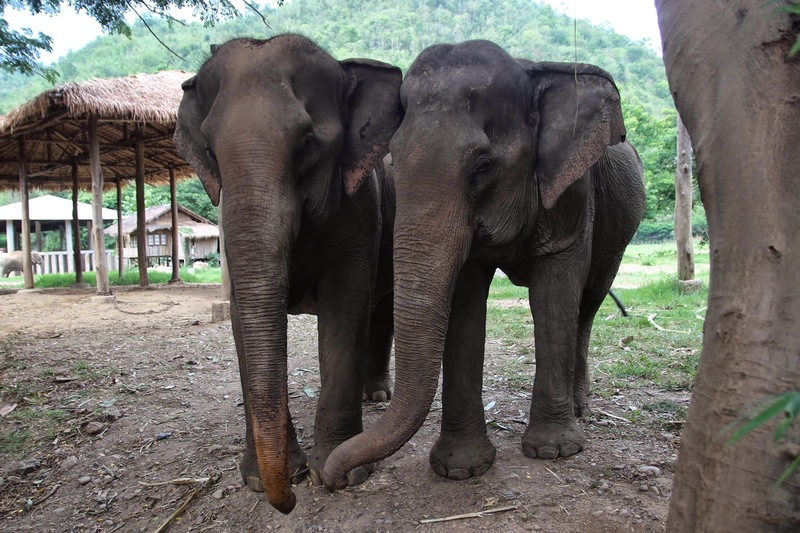 As a truck carrying a load of cornstalks for the elephants made its way up a nearby path, the two friends ran up to the truck, not so much threatening as making a lot of noise in general and creating a distraction, as their injured friend slowly made her way past. Once she had cleared the path, she began making a distinct high pitched noise as if to say, "all clear! 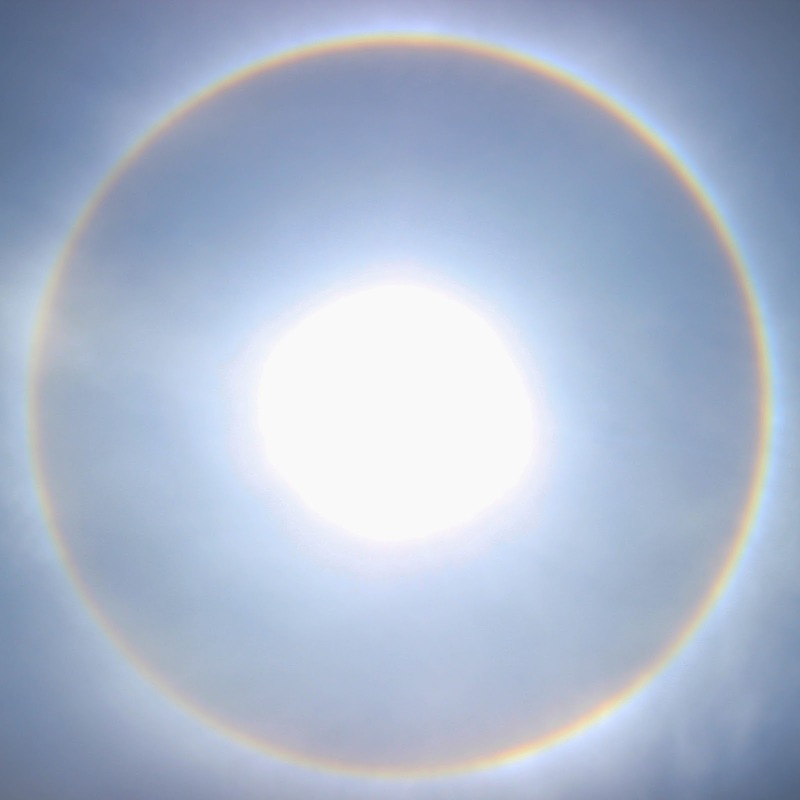 ", and her friends quickly disengaged from the truck and caught up to her, continuing on the way they were going. 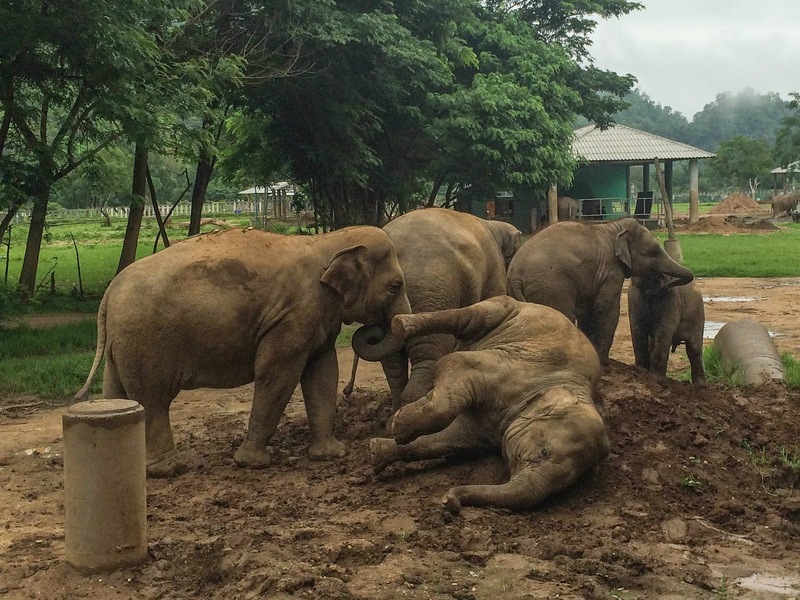 It's experiences like these that made me realize what a blessing it was to get to spend time at Elephant Nature Park, a sanctuary that rescues and protects elephants, offering tourists and volunteers the opportunity to witness their amazing personalities in as close to a natural environment as they could hope to provide. You won't get to ride them or get too close to the babies that run around the park, but you have the rare chance to see them unbridled, happy, free. 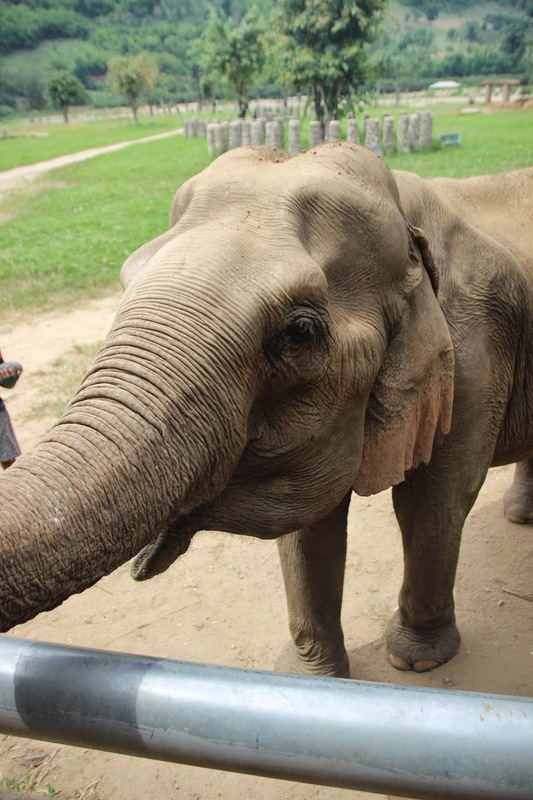 I've spent much of my life with an admiration and love of elephants… probably as a direct result of them being the mascot for my university's football team (and the same university my parents and many family members attended, so I was indoctrinated from an early age). But while that may have introduced me to these magnificent creatures, the fascination and appreciation of them did nothing but grow over the years. 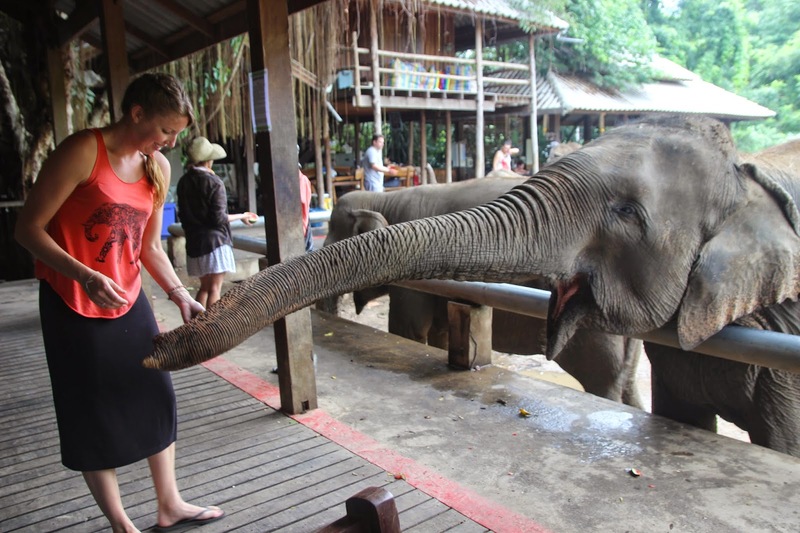 Before I had ever left for my RTW journey, when I was doing my very first bits of research on the things I absolutely had to see, volunteering with elephants was easily near the top of the list. 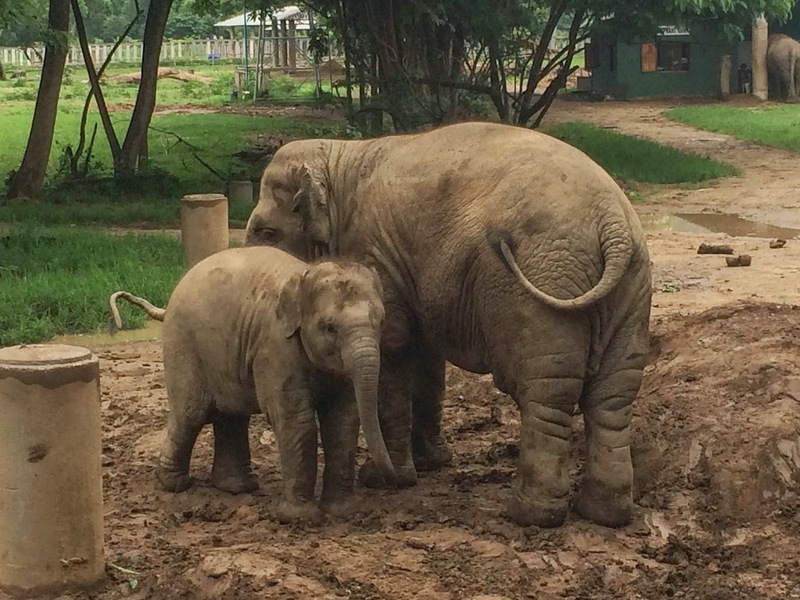 After doing some extensive research, I found the Elephant Nature Park outside of Chiang Mai. 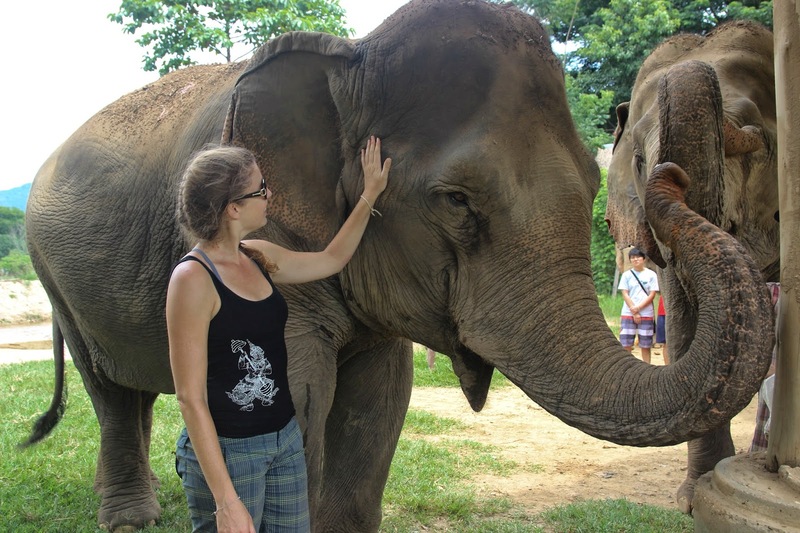 While I would have to pay a small fee for my volunteering experience, I learned that the money goes directly to the care for the elephants and support programs that work towards protecting these incredible animals. 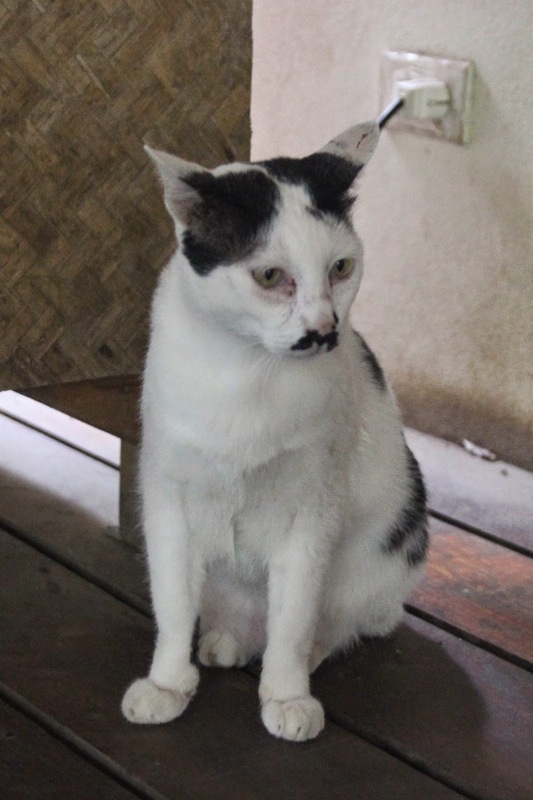 I didn't start off on the best foot with the park, who sort of forgot to pick me up from my hostel initially, leaving me sitting in Chiang Mai for a few extra hours. But eventually I did make it out to the park, and thankfully I hadn't missed too much. All of the volunteers were given t-shirts, water bottles, and water bottle holders (which were incredibly useful all weekend), and we gathered together in a stilted gazebo at the end of a long walkway - with amazing views of the surrounding hills, as well as the water buffalo and groups of elephants on the property - for an orientation session. 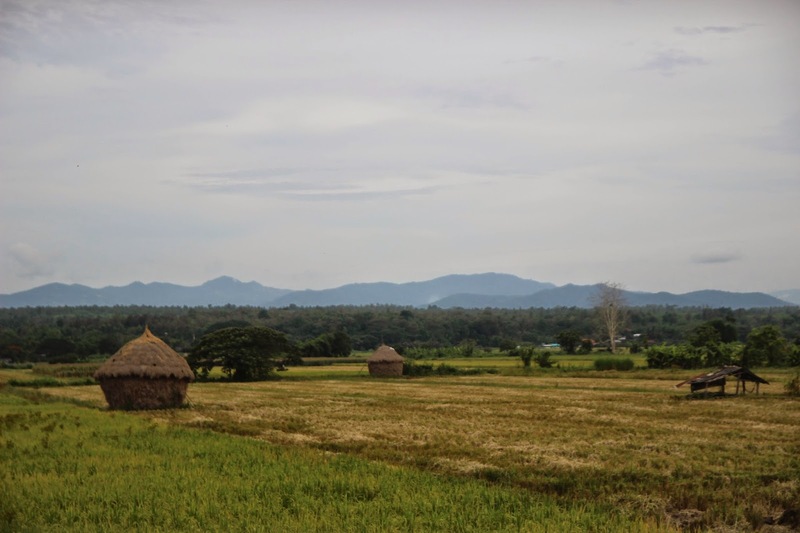 We were introduced to our coordinators and guides, and we went around the space introducing ourselves to each other, before we watched a short documentary on the background - and necessity - of the sanctuary, as well as its founder, Lek Chailert. 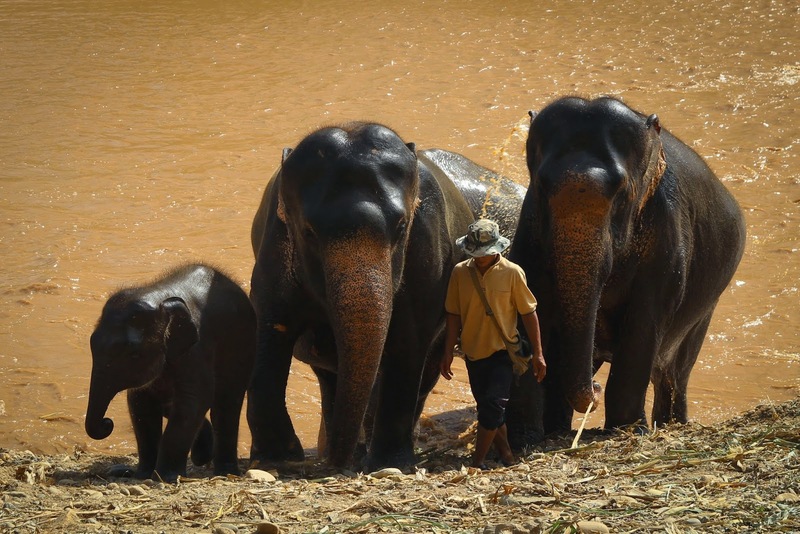 Unfortunately in Thailand, "domesticated" elephants are not given the same protections as their wild, endangered counterparts, but are instead treated as livestock under the law. 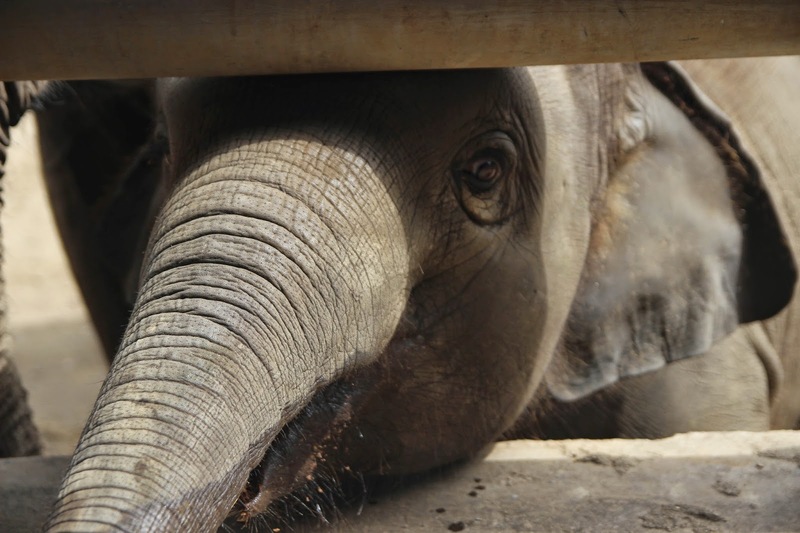 These elephants are typically subjected to a painful, traumatic "breaking" ceremony , in which they are taken from their mothers, held in a tiny space, and basically beaten until they stop fighting back. 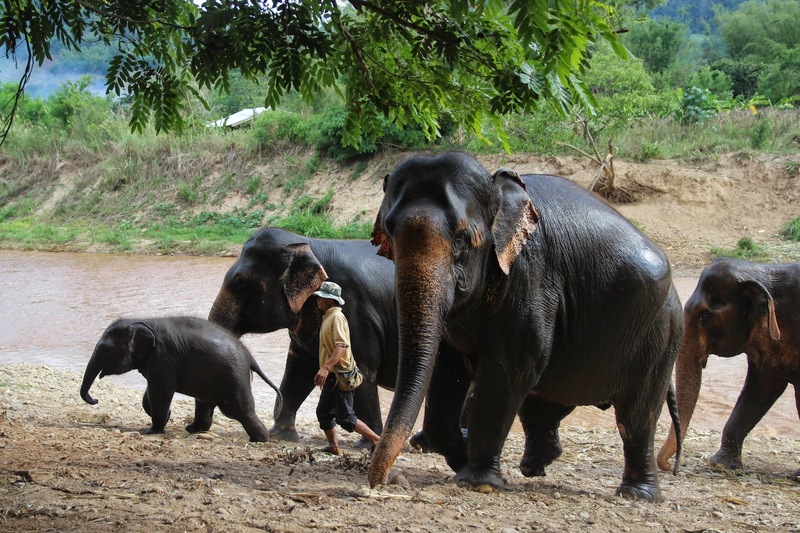 Many tourist operators further mistreat their elephants, letting too many tourists ride at one time, or forcing the elephants to take too many walks without adequate food or breaks. 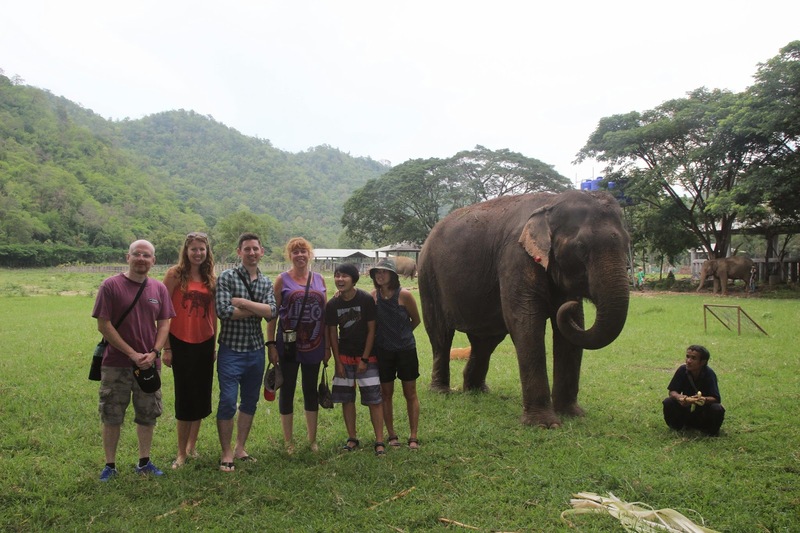 I'm not judging those that have participated in this type of tourism - I've ridden on an elephant twice before, excited at the opportunity to be close to those magnificent creatures - but it did break my heart to get the behind-the-scenes look at how many of them are treated. 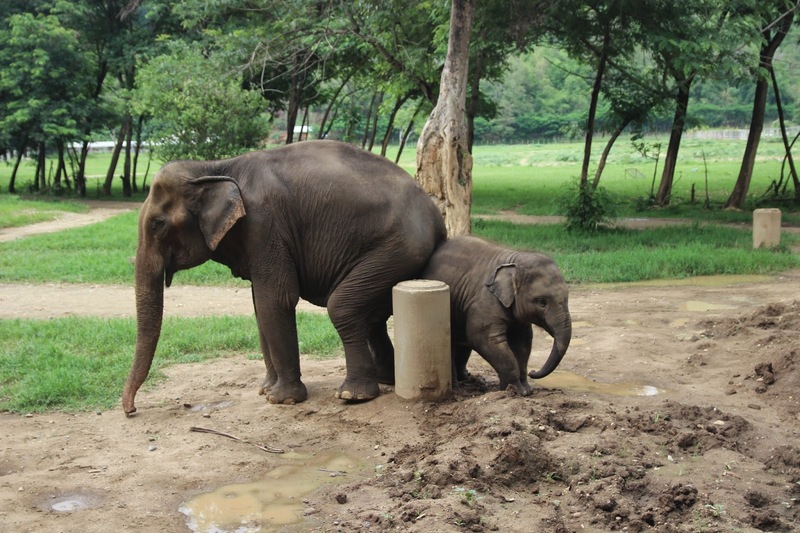 It simply means we all have to be better about researching how these tour operators treat their elephants. 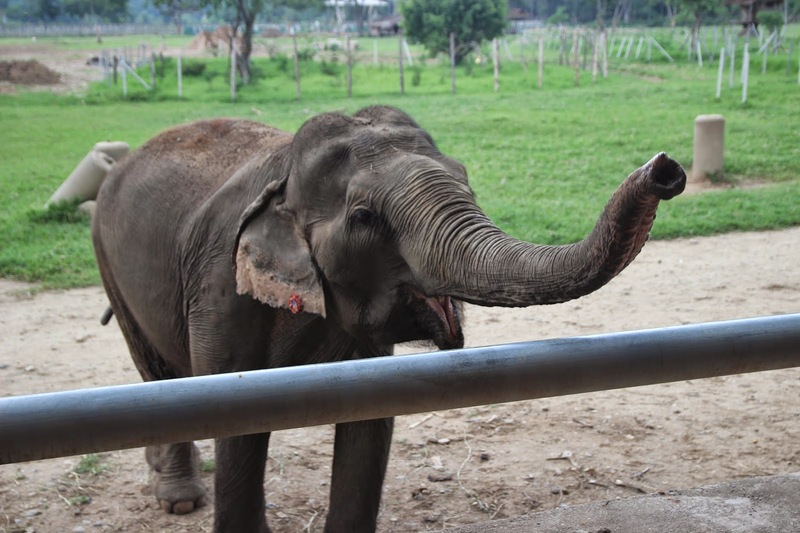 Thankfully many are following Lek's example - due in large part to her success and the education efforts of her Save Elephant Foundation - and changing how they do operate, and in many cases switching to observational tourism. 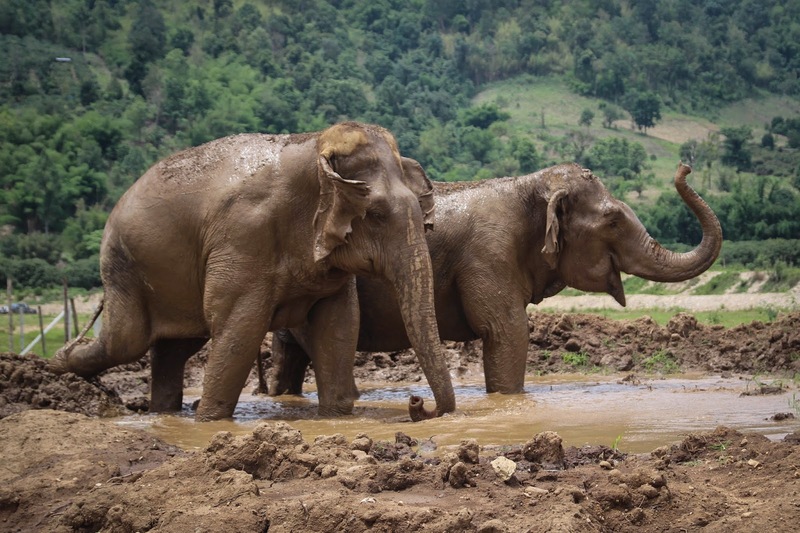 Our first interaction with the elephants came just after our orientation, when we were allowed to help bathe a group of three in the river - something that would become a daily opportunity. 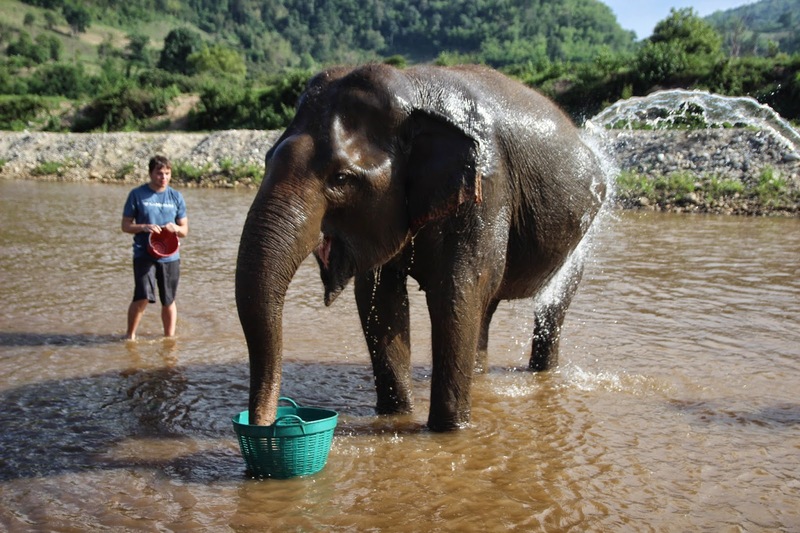 We each carried a small bucket to the river, where the trio of elephants were happily munching away on melon and pumpkin, using the buckets to scoop up the water and splash it over each of their backs. 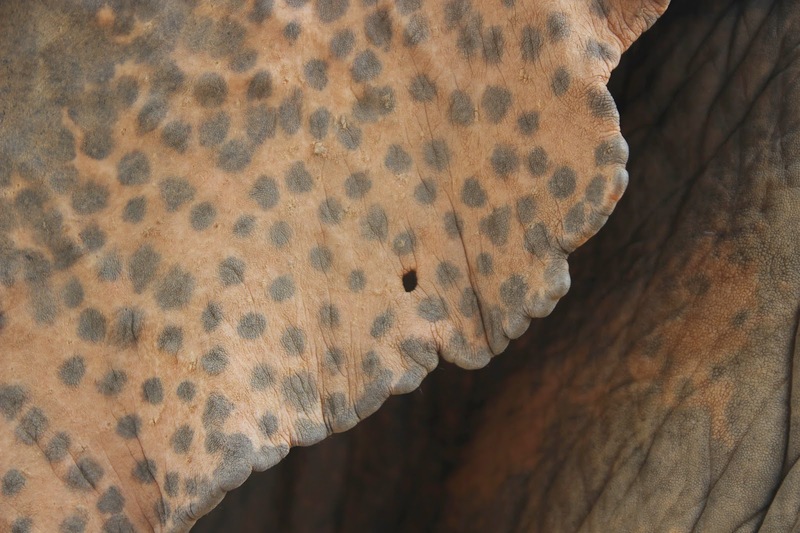 Once we were done with the bathing, the mahouts gave us bits of melon and bananas to feed to the elephants, gently placing the treats into their trunks and petting their thick, rough skin. 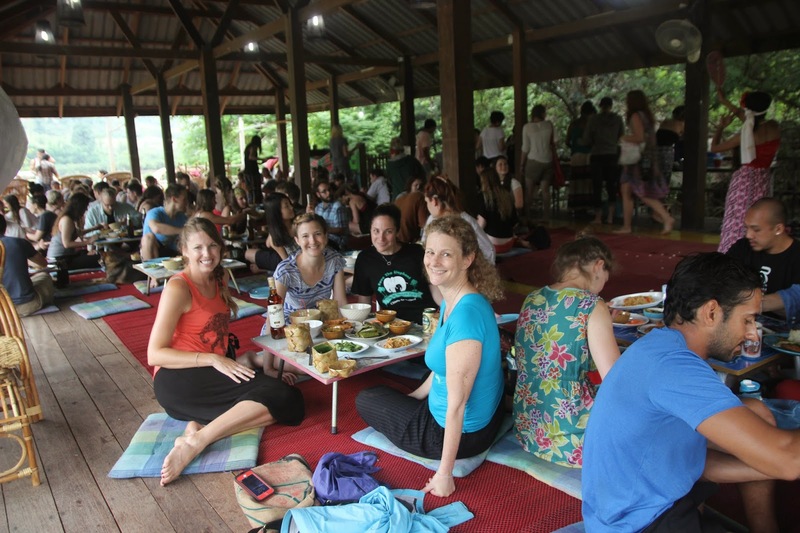 Next, we returned to the main area where we would gather for mealtimes - a large open air platform full of tables and chairs, with views out into the park. 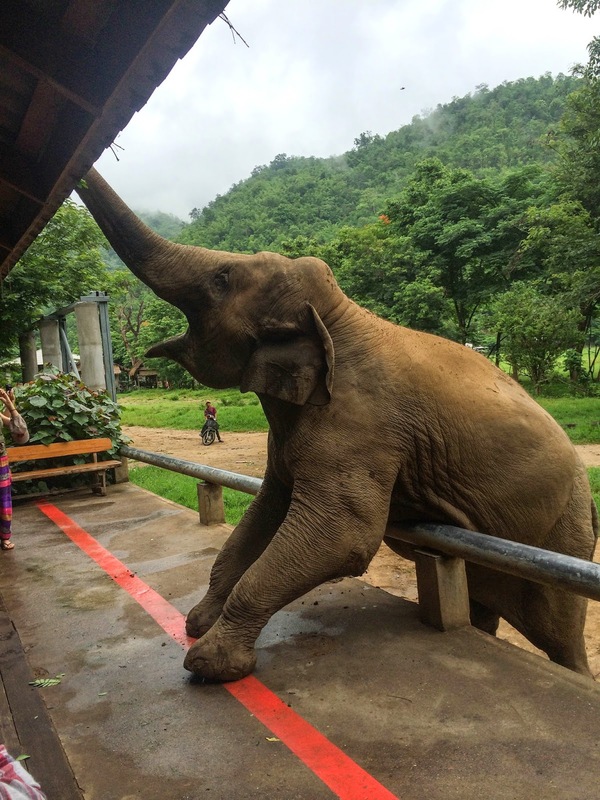 The elephants would regularly come right up to the platform to be fed melon and bananas, and it was a joy to watch them interact with each other as they came to be fed. We were led up to the second floor of the major platform - another open air area - where were given a welcoming ceremony, complete with a tiny band of local children playing traditional instruments. 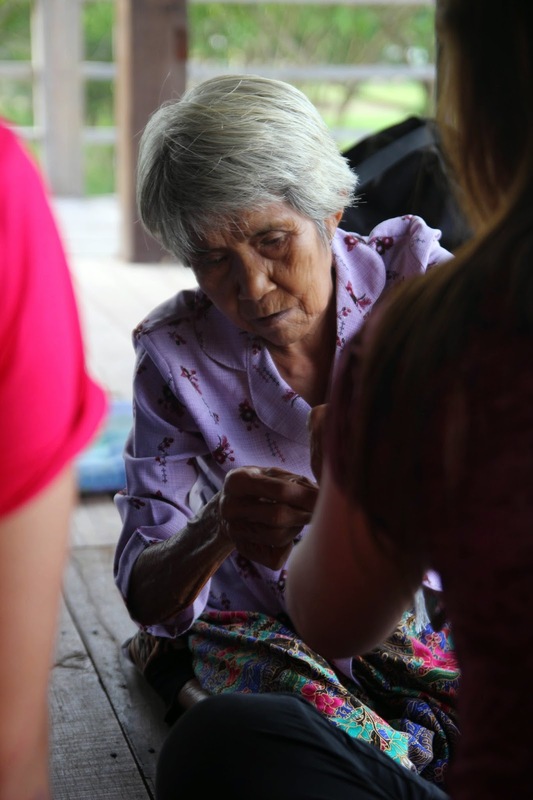 A shaman from one of the nearby hill tribes performed a blessing on the group of volunteers, placing a white string around each of our wrists for good luck, and sprinkling us with water. 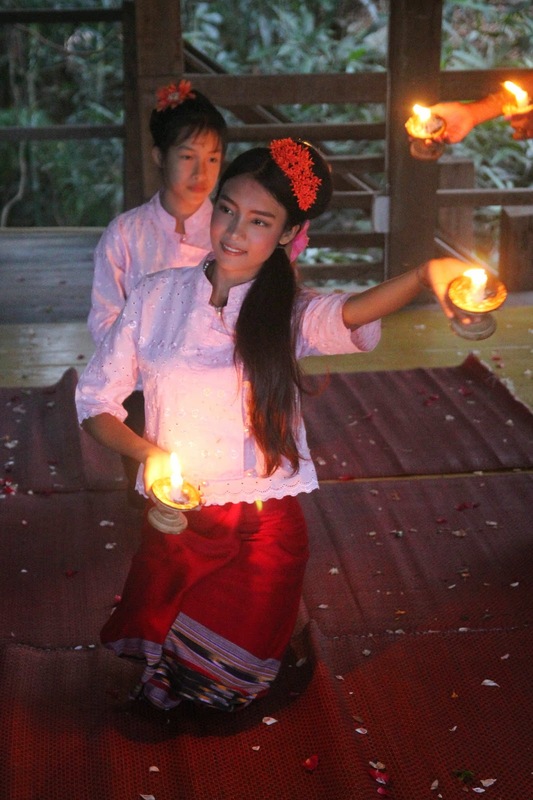 The ceremony was followed by dinner - which I quickly learned was all vegetarian - I definitely packed on a few pounds that week trying to fill myself with heavily sauced veggies and noodles, despite the manual labor! 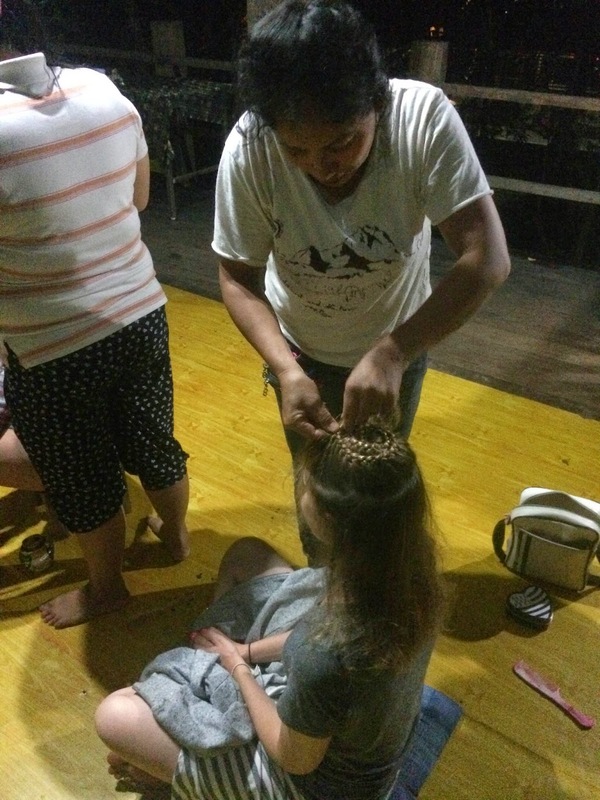 After dinner, my new friend Jenny and I made the first of many trips up to the area where our ceremony had been - each night, a group of local women provided inexpensive and wonderful massages . 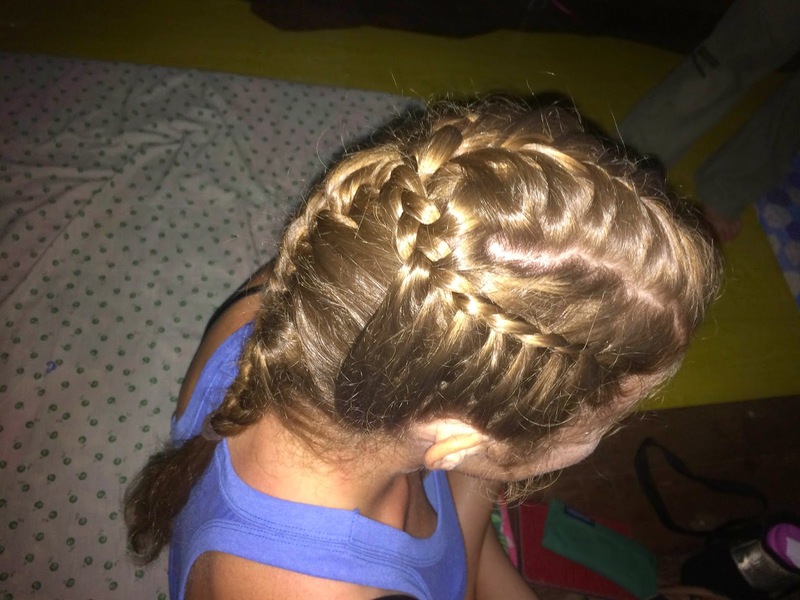 After my massage, the woman motioned to my hair, and before I knew it, she was working on an elaborate braid! 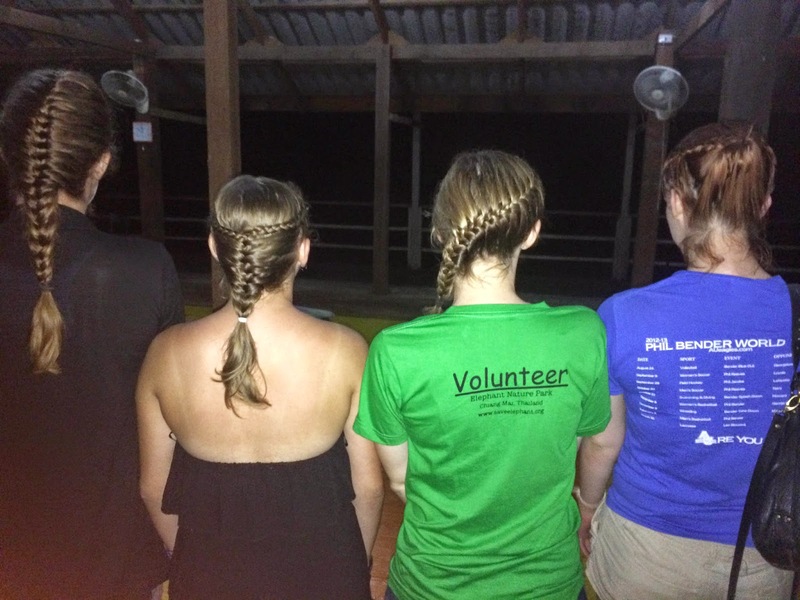 This would become a nightly ritual for both Jenny and myself, and as word got out, many other female volunteers would visit the ladies for massages and braids each evening! The primary culprit, right outside our room. 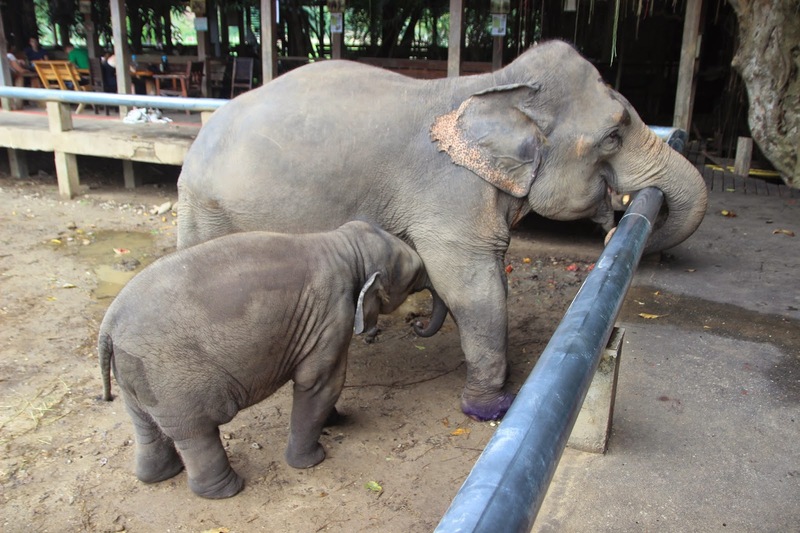 Our first full day at the park, we were broken into groups of five for rotating morning work assignments, which included food preparation, cutting down corn stalks, cutting down banana trees, scooping poo, and taking an "elephant walk". 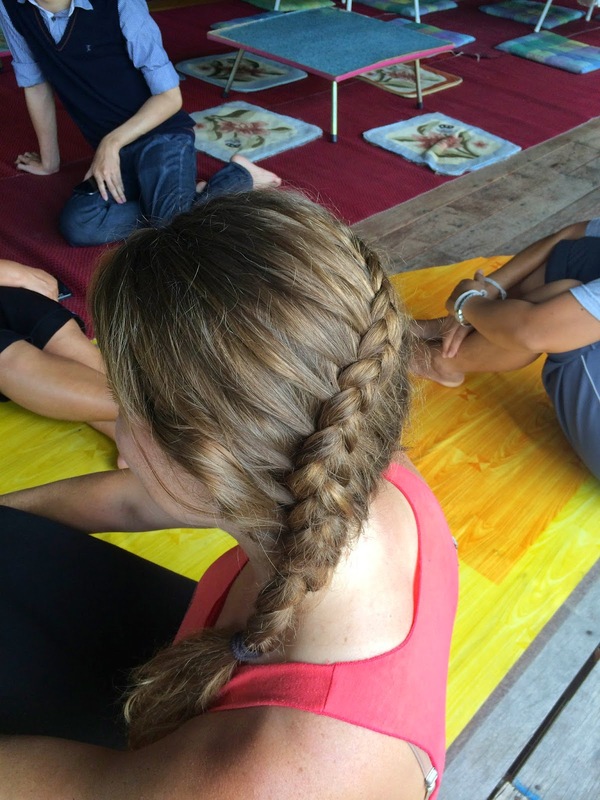 For each of these tasks, we would work with an individual volunteer coordinator. Afternoon work was mostly done as a large group. 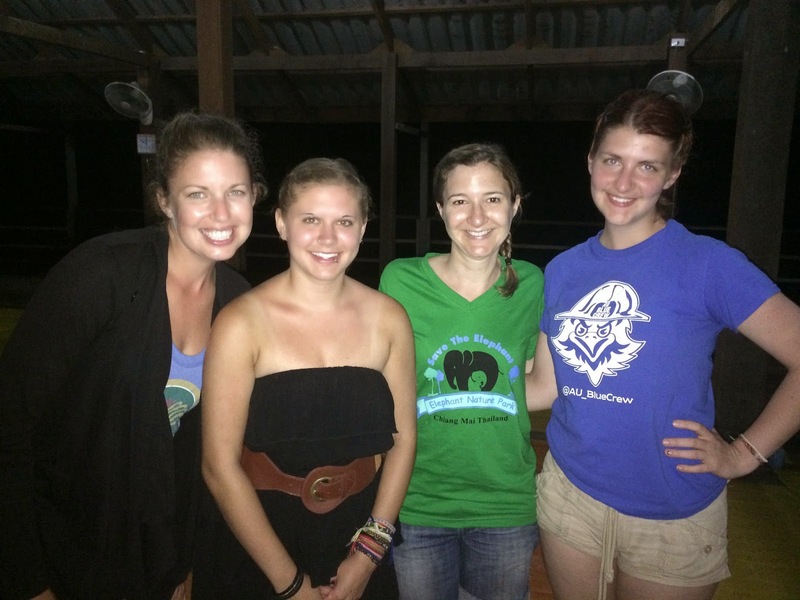 Our group was assigned "ele food" - food preparation for the elephants - to start the week. We moved to a small area close to the main pavilion and started by unloading a truck full of small watermelons, storing them in a large pen within the space. We then split into smaller groups to attack smaller tasks - sorting watermelons and loading them into plastic baskets, carrying them to a trough to be washed, then scrubbing the melons and loading them into more plastic baskets. 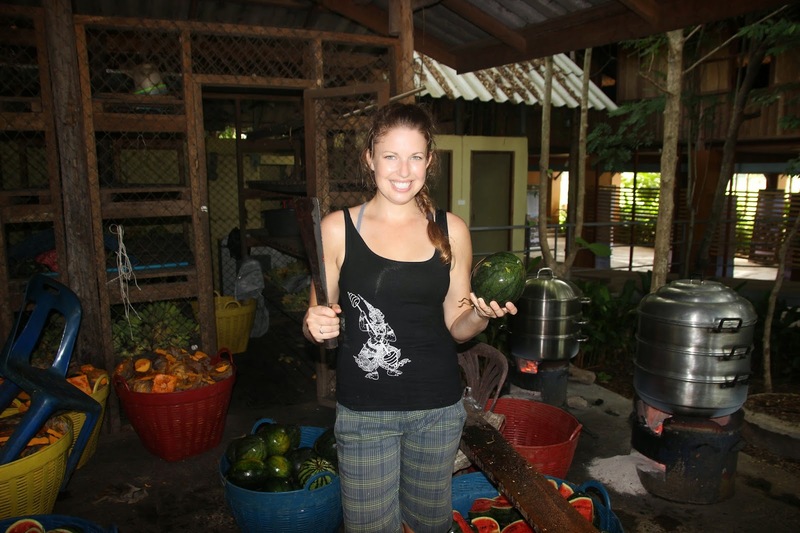 After assisting with the carrying for a while, I was handed a machete for melon-chopping duty. Once we had chopped up plenty of food, I joined two other group members in making a mash for the older elephants - first peeling tiny bananas, then mixing them with dried corn, tamarind pods, and some sort of ground dried rice, mixing and mashing them together to form patties that could easily be fed directly to the elephants. 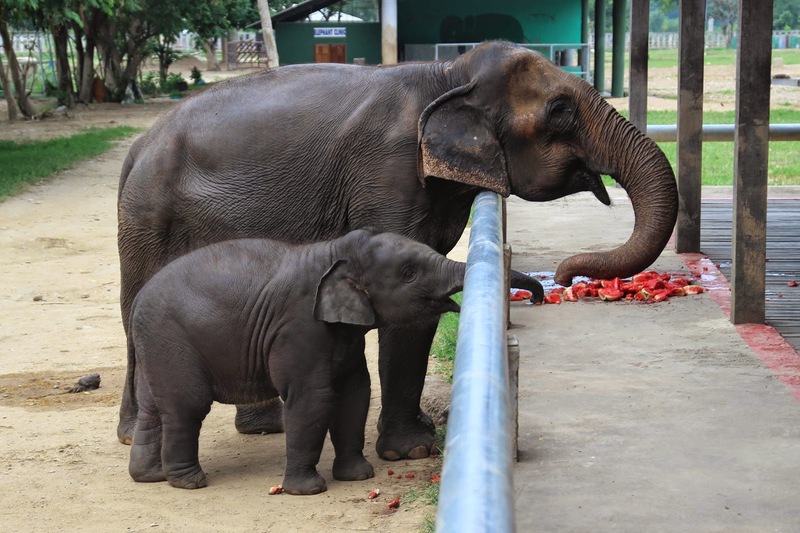 Because of our proximity to the main platform, anytime we were given a quick break we could run over to watch the elephants walking by, sometimes taking the opportunity to feed them some of what we had just prepared. After lunch, we saw a few of the elephants coming up from the river, having a chance to feed them a bit and interact with them more closely. 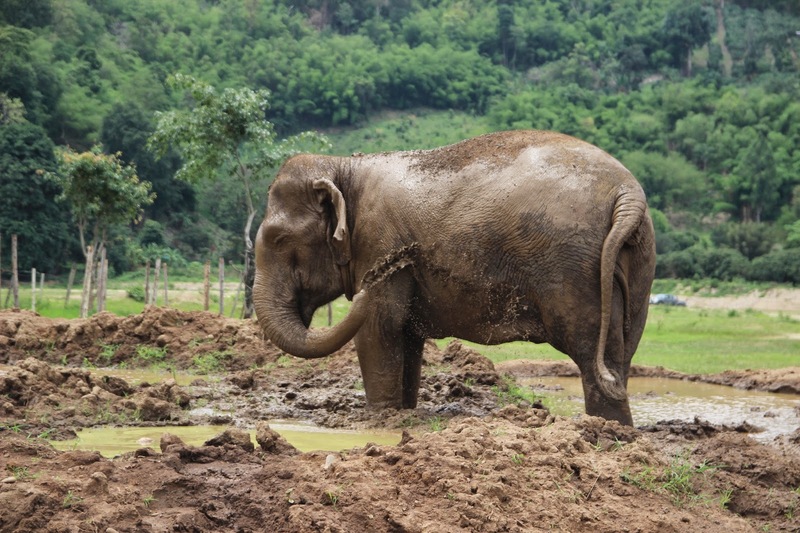 Soon the elephants moved into a nearby mud pit, splashing, rolling around in the mud, and throwing dirt all over themselves! Afterwards, the entire group reconvened for our afternoon activity… "planting grass". Half the group were given hoes and directed to actually pull up the grass that was growing in a nearby ditch and transplant it inside a newly built pen. This turned out to be the one job that exactly none of us were too thrilled about. 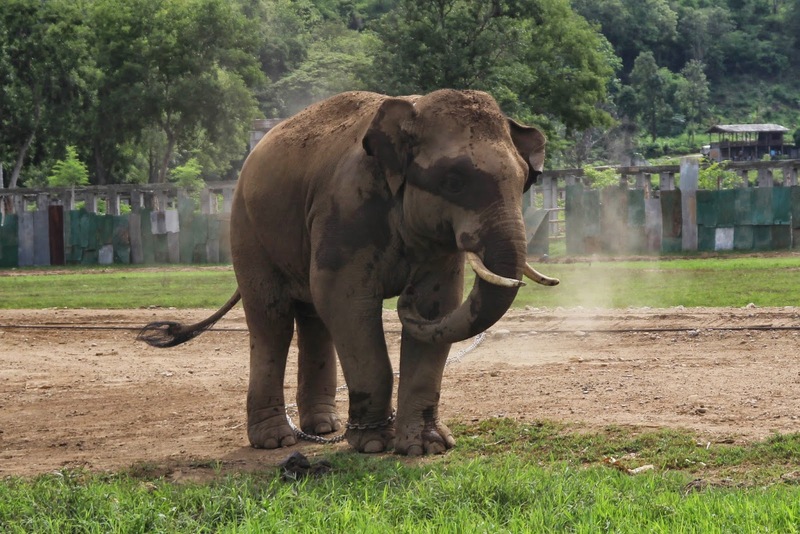 Thankfully most of our jobs, even if they were very difficult, left us feeling like we were directly supporting the lives of the elephants themselves. As we wrapped up, a few of us found ourselves simply standing and watching Hope, one of the young male elephants, who had already been moved inside his bull pen. Apparently he was in a musth phase, which is a period of time when the bulls become very aggressive and sexually active. 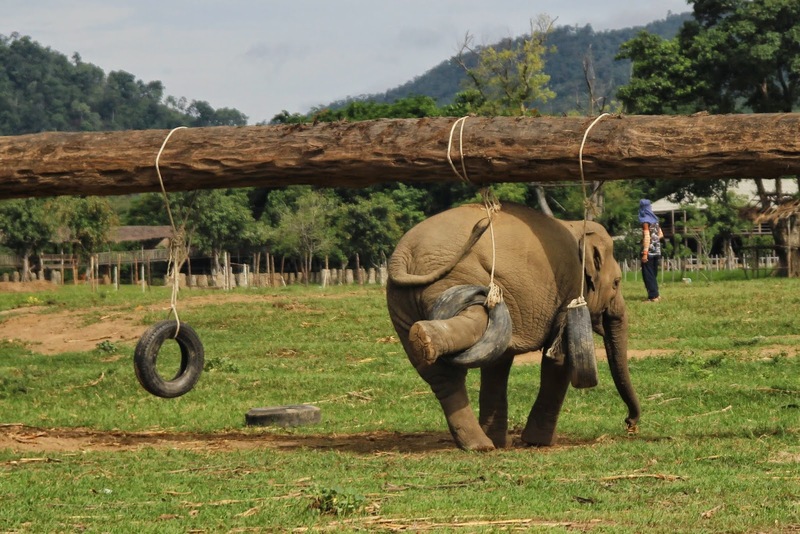 For this reason, they were keeping him separated so that he didn't risk attacking or aggressively attempting to mount the other elephants. 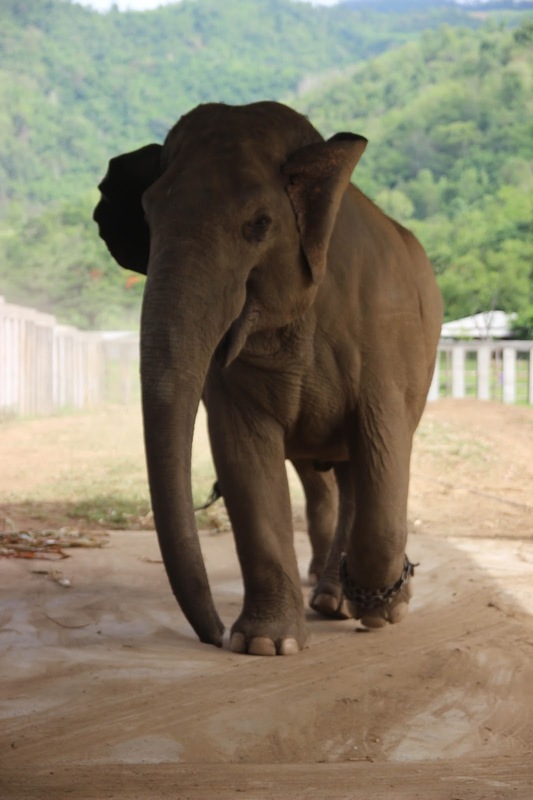 That evening, we had the opportunity to hear from Lek herself, first watching a quick video on the dog rescue activities within the park, then hearing her speak directly about the mission of the Save Elephant Foundation and Elephant Nature Park. 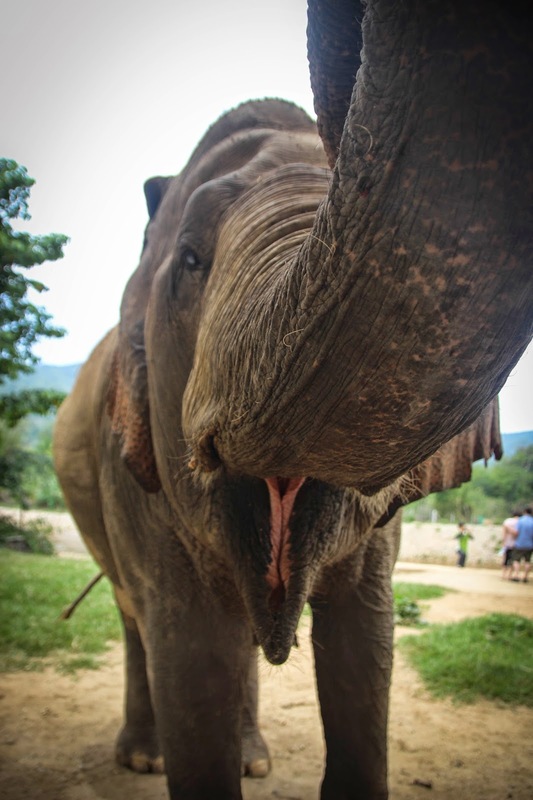 Between her talk and the previous day's video, it was incredibly eye-opening as to how these beautiful creatures are treated in many parts of Southeast Asia, used for illegal logging activities or exploited for tourism. The following day our group was given one of the most notoriously difficult assignments: cutting corn. Each of us dressed in long pants and long sleeves and given gloves to protect our skin from the rough cornstalks and insects. 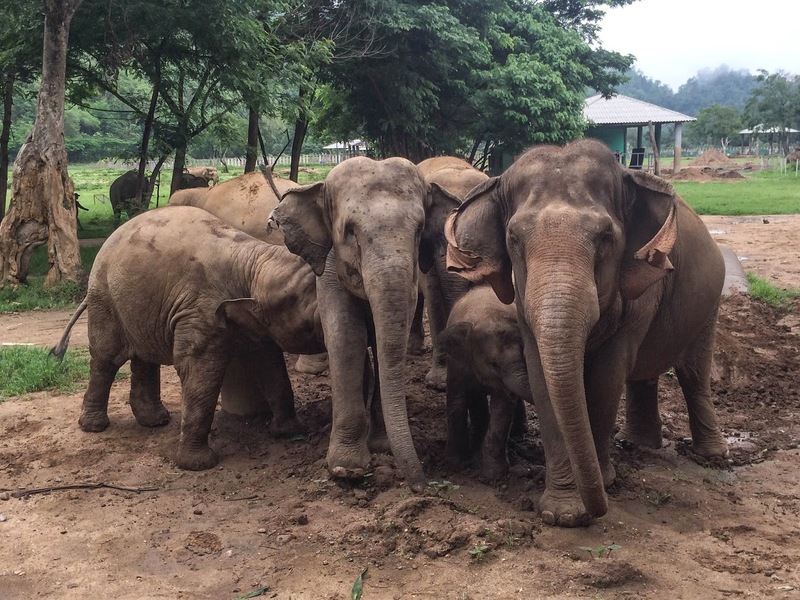 As we gathered we realized we were missing quite a few people from our group - three of the girls had been reassigned to the veterinary program, and one guy took it upon himself to avoid all of the difficult manual labor and take elephant walks every day with his camera. Jerk. We were left with a total of eight people - myself and another girl from the US, who was with her Swedish boyfriend, a guy from England, two girls from Singapore, a guy from Austria but living in Germany, and my roommate from Spain. Of all the groups, I'm fairly certain ours was the most diverse!! 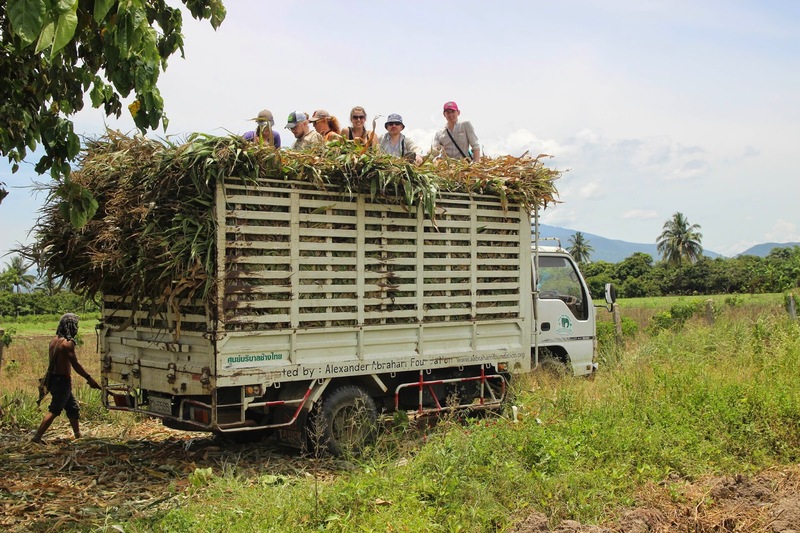 We piled into the back of a massive truck, hanging on for the long ride out to the corn fields, passing other elephant tourist spots, people riding on elephants' backs and in cow-driven carts. 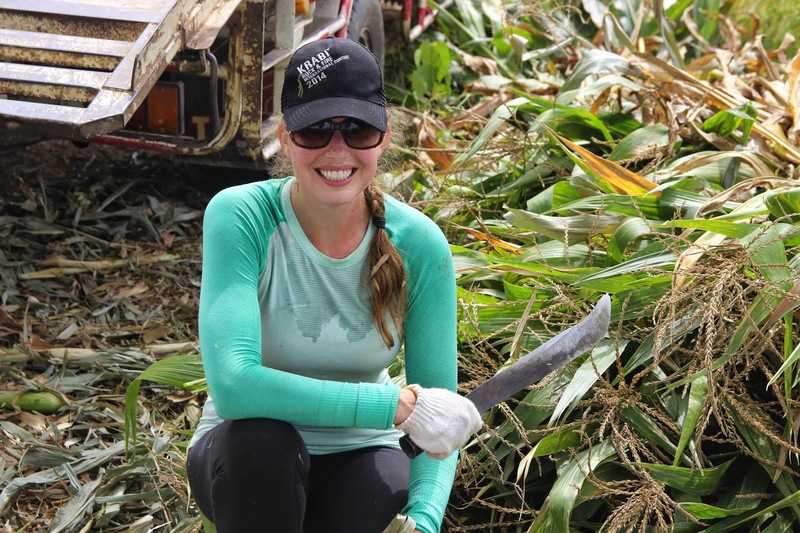 Once at the field, we were given machetes and some quick instructions, then were set loose, chopping down the corn stalks and piling them up in clumps of roughly 20-30 stalks. We made relatively good time chopping through the various rows, and I actually enjoyed the manual labor - we were working hard, and we were seeing clear results. After just a couple of hours, we had cleared the field with the help of a few Thai workers who had joined us. They began tying up our bundles, and we all started hauling them to the truck. At some point, we figured the loading was nearly done, so we took a break, opening our packed lunch of noodles, fried rice, bread, bananas, and peanut butter. Jesse and I - the two Americans - excitedly made peanut butter and banana sandwiches to the mixed amusement and disgust of our co-group members! 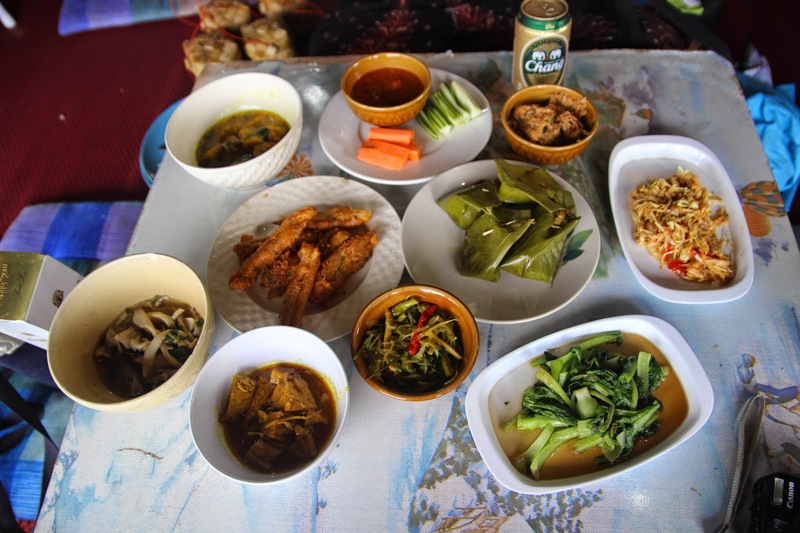 I felt a little guilty as there wound up being quite a bit more bundles to be carried, but eventually the truck was fully loaded (we were astounded at how full it was), and the Thai workers had lunch as well. Then we all piled in, up on top of the corn, for the long ride back. 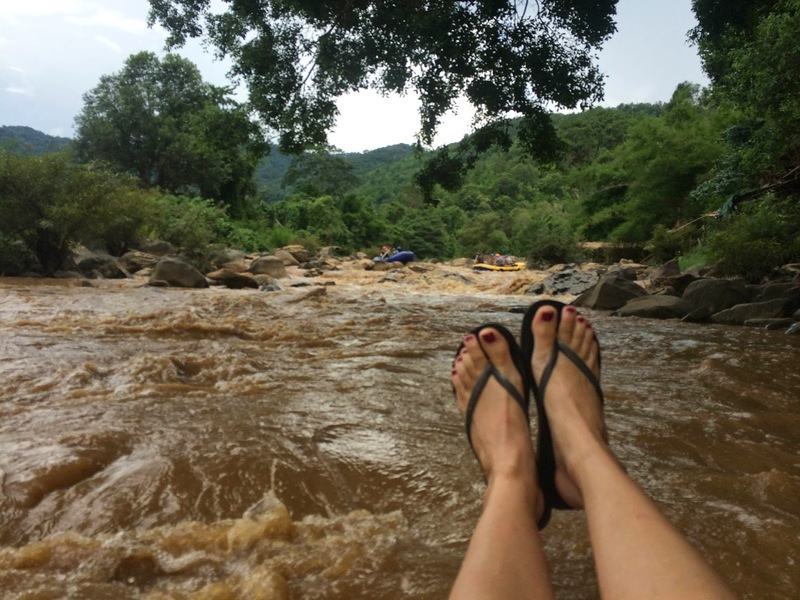 Since we returned at 1:00 pm, our reward was not having to participate in the afternoon work assignment, instead changing into swimsuits and going tubing down the river running next to the park. The weather wasn't great - actually a bit more cool, so the water was more cold than refreshing! We also started hearing thunder and seeing lightning as we neared the park, so I was anxious to get out! 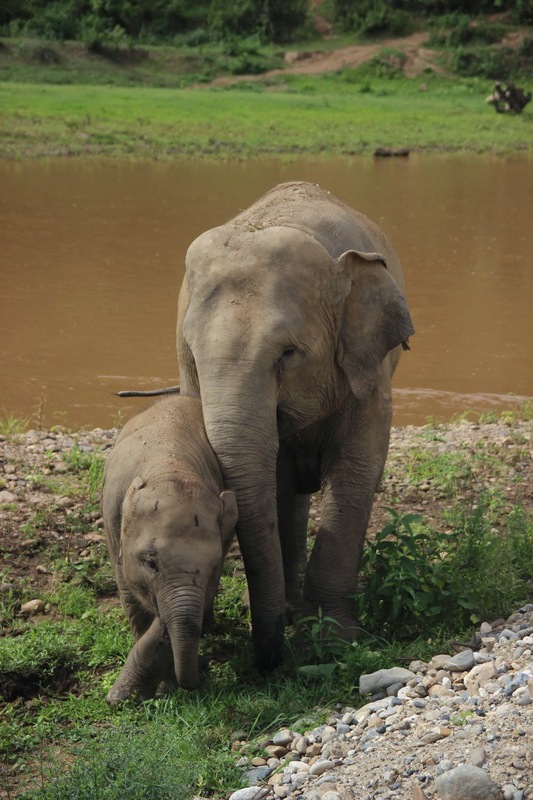 The water was very shallow and relatively slow-moving since we were at the very start of rainy season, but we eventually made it back, passing one of the elephant families with a baby up on the banks just before we stepped out of the water. After a quick shower, we met out on the skywalk to hear from Jodi, a former tattoo artist who has been living at the park for 10 years, who shared information on safety and animal behavior, especially some of the "elephant gossip" - who was bitchy, who was friends with whom, who was jealous or flirtatious or protective. 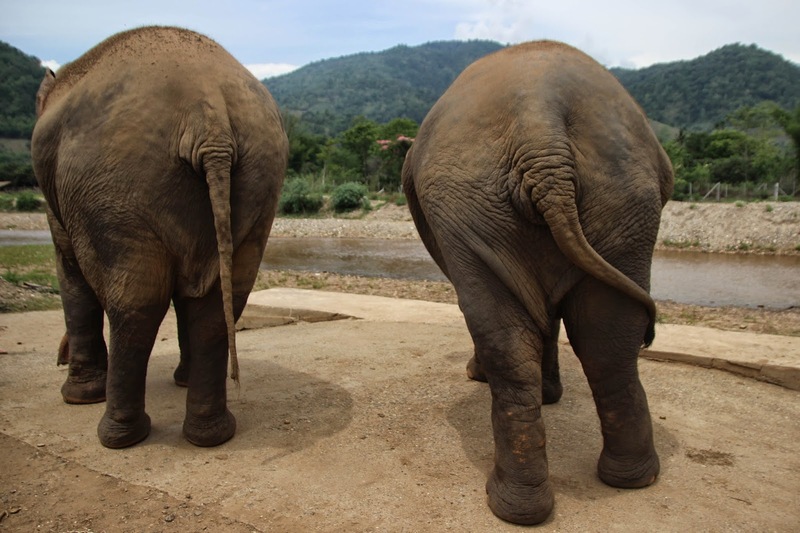 It was really fascinating to hear, and the next day we got to see much of that behavior on display as we had the chance for our elephant walk. 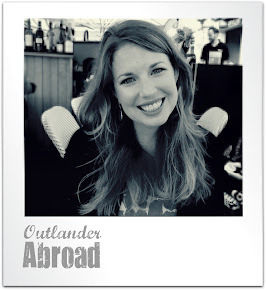 That next morning, we slowly meandered around the park with one of the volunteer coordinators leading the way. 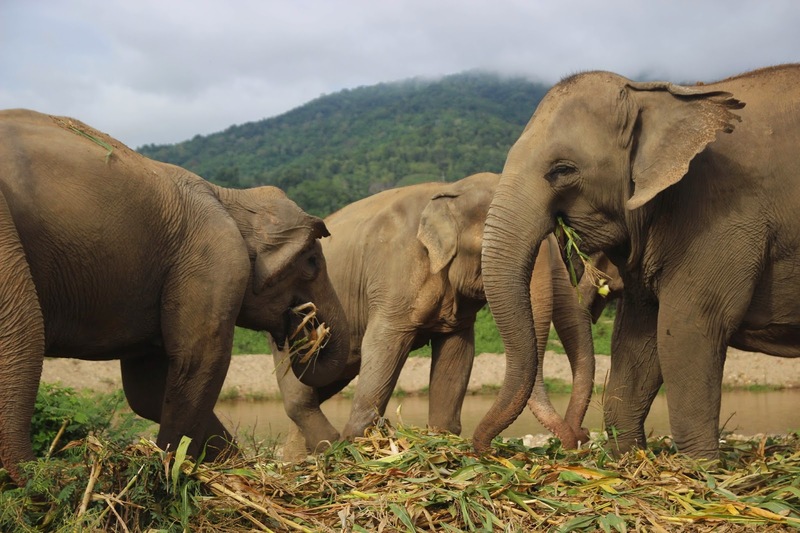 We first encountered a group of female elephants eagerly munching on the corn we had gathered the previous day. 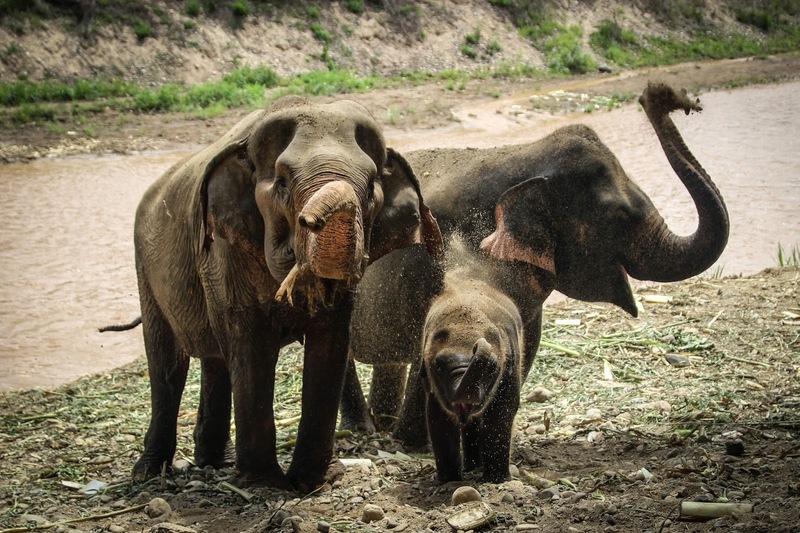 Our guide shared a bit about each of their backgrounds - many of the elephants have been rescued from illegal logging, and some have been injured in landmine explosions. 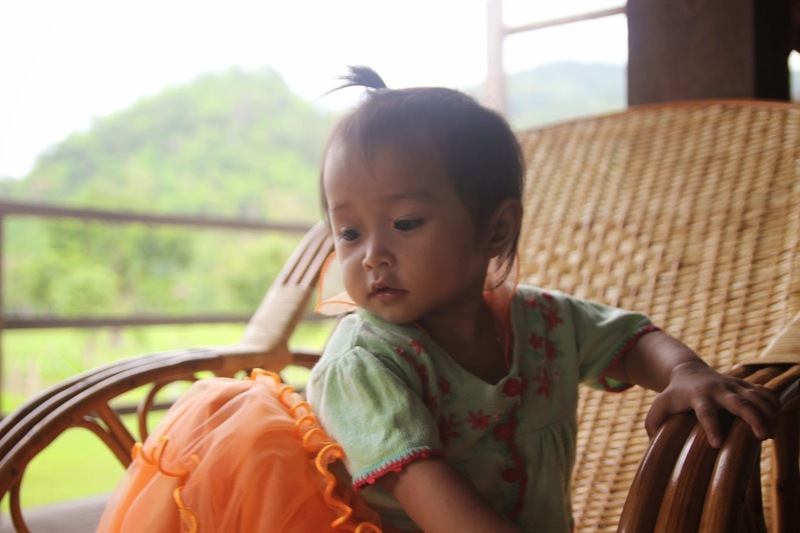 Next, we came across one of the larger family groups, which included an adorable baby named Dok Mai, as well as Faa Mae, a precocious five year old female who is an adoptive big sister to the baby and who was raised at the park. She's very close with Lek and is a bit of a spoiled princess who loves attention. She actually managed to divert our attention away from Dok Mai by playing with a set of tire swings, kicking and pushing and stepping in and out of them. When I realized what she was doing I had to say, "oh… she's good!" A highlight of the walk was witnessing the family unit walk up to the watering hole where Jungle Boy, a young "tusker", was chained up at his pavilion. 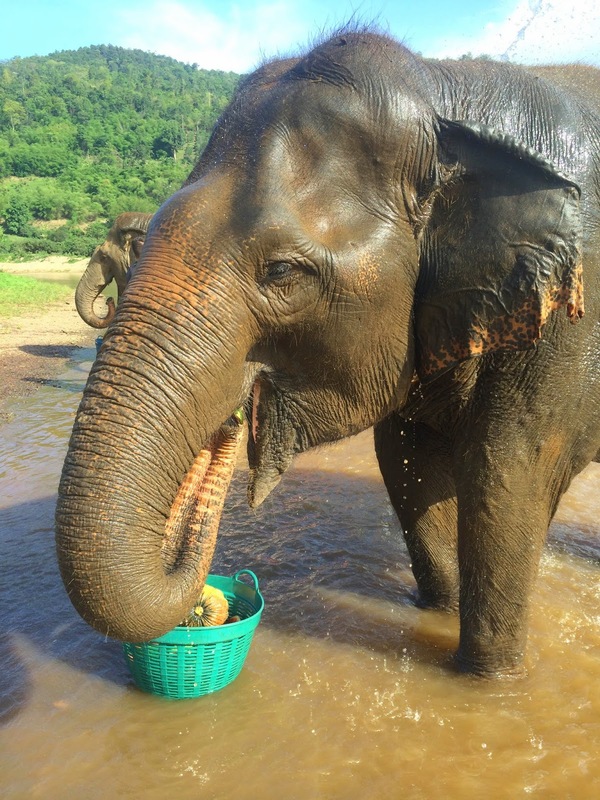 He walked over to join the family and get some water, mingling with the elephants as Dok Mai nursed and played. Next we walked over to Hope's pen, not staying too long as he was in a pretty feisty mood! He was munching on some banana tree and actually stripped off a bit and threw it at us! A few minutes later, as were starting to leave, he sucked some water up in his trunk and started walking towards us - we cleared out just as he sprayed water through the bars where we had been! 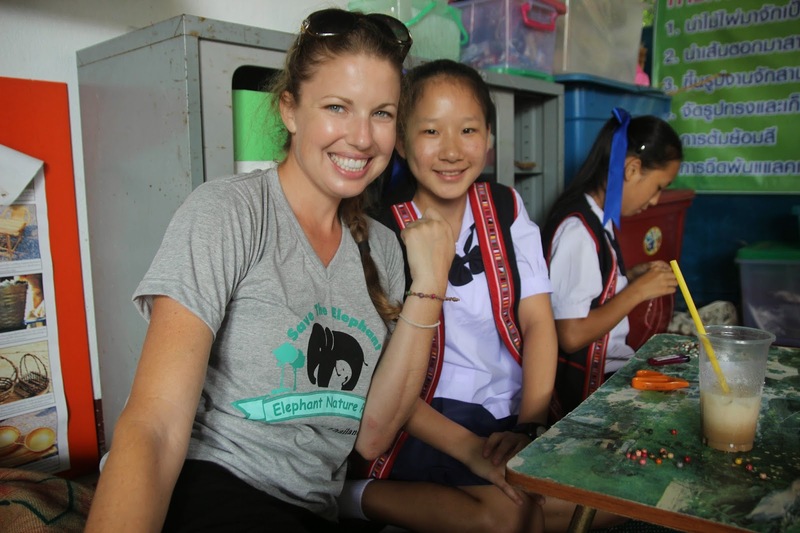 After our elephant walk, we got cleaned up for a trip over to a nearby school where, in addition to a normal curriculum, the kids learn trade skills that they can take back to their villages. 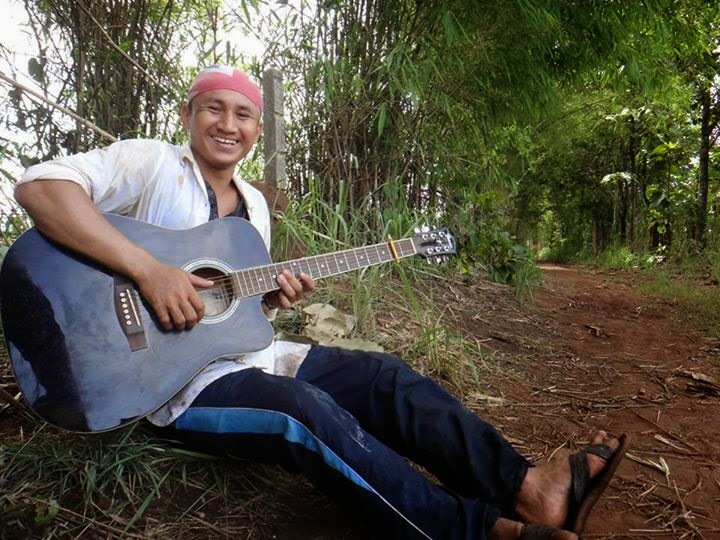 We were turned loose to interact with them - many of us bought coffee from two tiny barristas, a few played soccer or got foot massages, and I sat down with some girls who were making bracelets using macrame knots - something I used to do to make some extra cash when I was about their age! I made a bracelet with one of the girls, each of us knotting about half of it (though it sadly fell off my wrist somewhere in Chiang Mai about a week later). 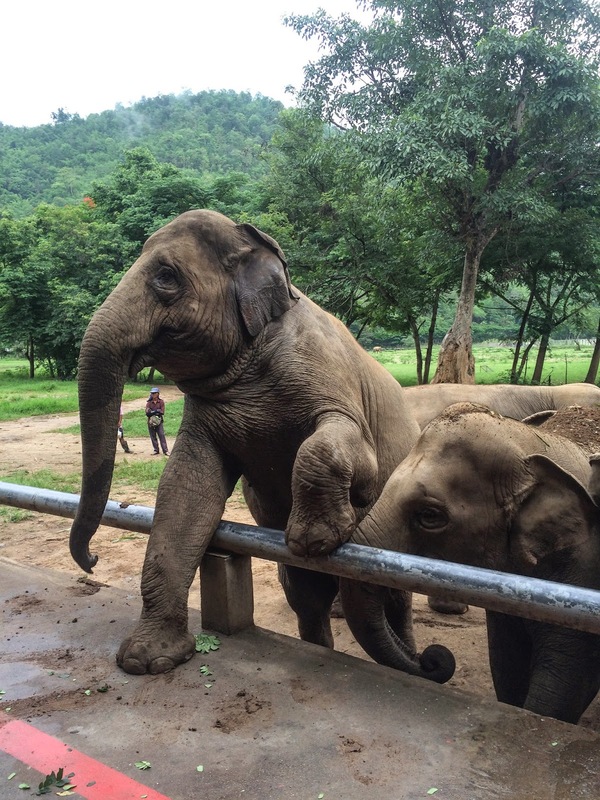 We walked back to the park through a back alley, crossing a rickety bridge over the river, pausing to watch an elephant family (with a baby!) as they munched on corn stalks and banana trees, returning at the very end of our lunch time. 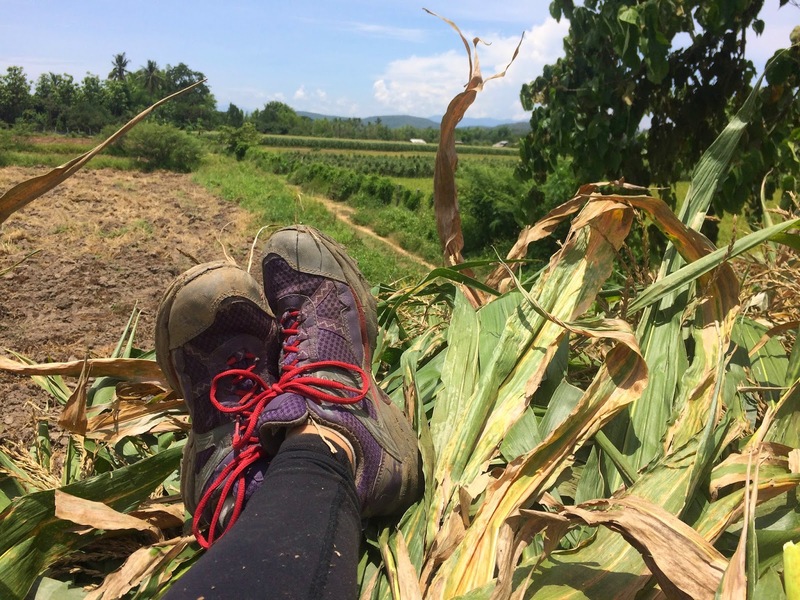 After lunch, we changed back into our work clothes and broke into larger groups - some set off to cut banana trees, some retreated to walk dogs, and the bulk of us went to plant corn. On the way over, Jenny and I were completely distracted by the elephant family playing and bathing in the river, stopping for a while to watch and take photos of them as they sprayed themselves and laid down in the water, using their trunks as snorkels, while the baby splashed and played and just generally exuded cuteness. Finally, Tor, our volunteer coordinator for the afternoon, retrieved us and led us to the field where we would help plant corn. A handful of people created shallow holes using hoes, while the rest of us dropped small handfuls of corn seeds - what looked like dried kernels died pink - into the holes and covered them. With so many people, it didn't take long for us to finish the little plot of land. I sat and chatted with Tor for a bit, continuing our conversation about how he had grown up in a nearby Karen village, how he was studying tourism at a local university, and how he wanted to eventually have more responsibility working with the tourists at the park, as we all slowly walked back. 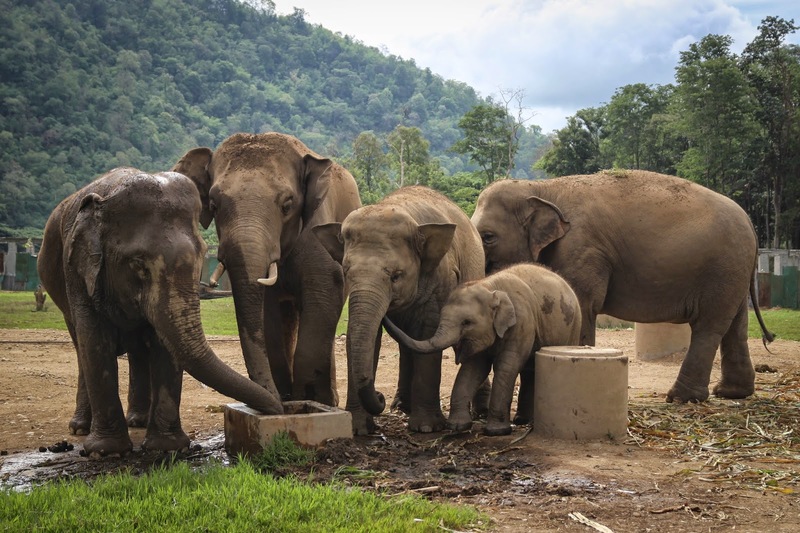 We all stopped for a beer at a small convenience store on the way back, then passed the same elephant family on the way back and again had to pause and watch! 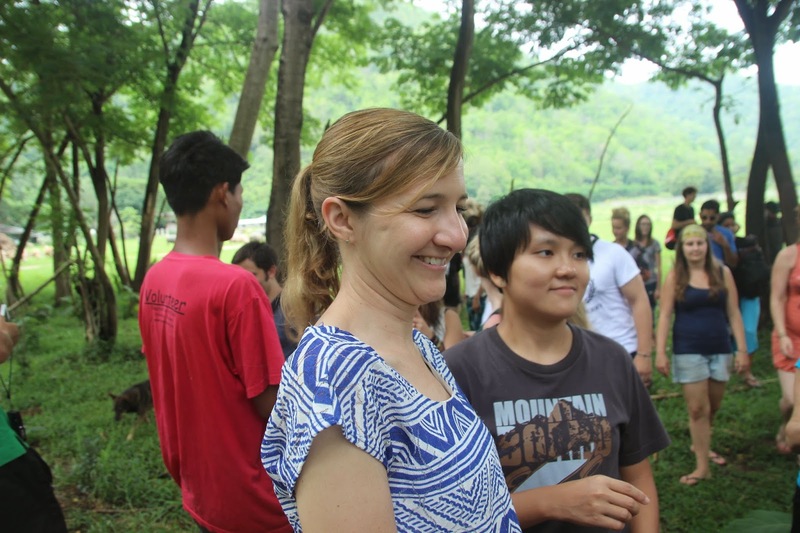 The next day marked a return to manual labor, as our group was assigned to scoop elephant poo. 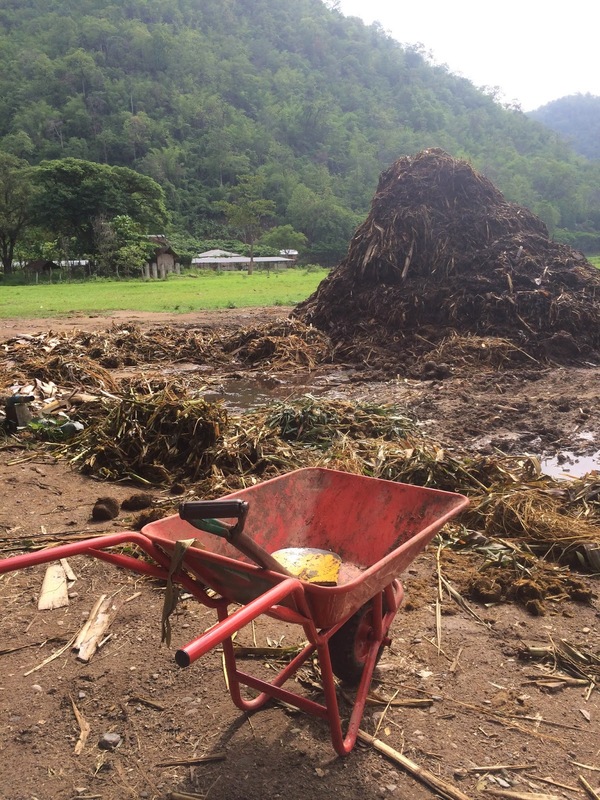 After a massive downpour the previous night, the cornstalks mixed in with the poo piles were wet and heavy and somewhat difficult to manage. 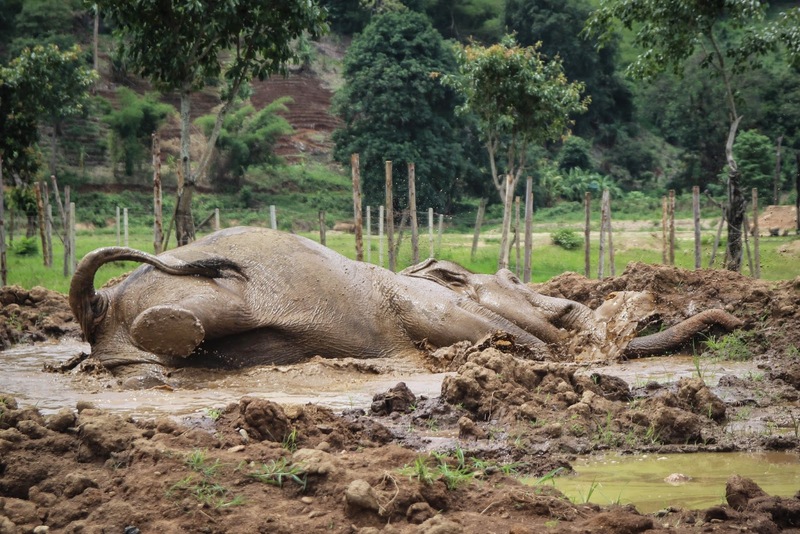 We split up, each with shovels and wheelbarrows, attacking the various piles in the elephants' nighttime shelters and wheeling them out to a massive pile. Eventually our guide showed us a "group technique" for getting the bigger / more difficult piles taken care of, and I joined up with Jesse and Viktor to more efficiently start clearing out the poo. Eventually, we rounded the corner to the final shelter - the rest of the group was in a single pen, so we moved to help with the second one, but we were quickly told we needed to help with the other one first, because an elephant was scheduled to come by for training. 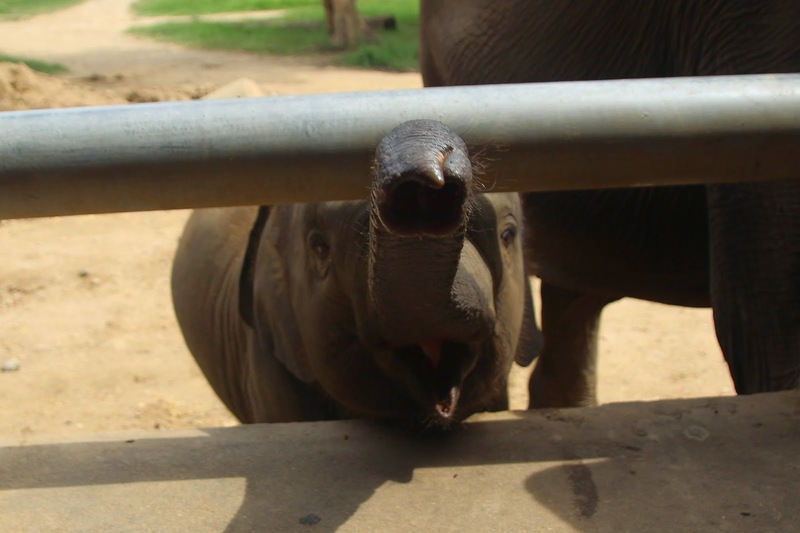 Almost immediately, we looked up to see the elephant coming right at us! 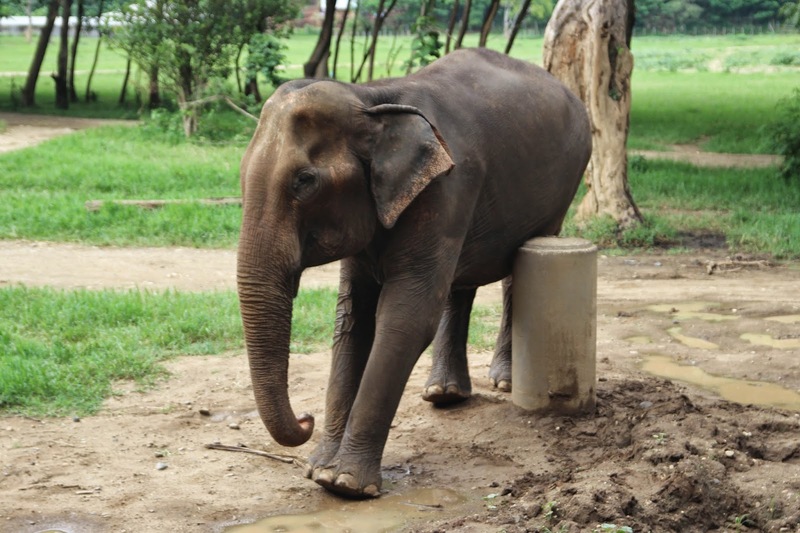 The mahout steered her away for presumably another lap around the park, and we hurriedly worked - some of us rapidly filling wheelbarrows as others took them out to the pile as quickly as possible - finishing the final pens in short succession! After lunch, the task for the afternoon was listed as weeding, but after having such a big group the previous day, they gave us more options of work to choose from. I opted to go down to the dog rescue area with a few others. They actually had plenty of dog walkers that day, so we each visited a few of the large pens in groups of two or three to play with the dogs. Our final full day of manual labor consisted of chopping banana trees. I was surprised at how they grow - almost in layers, like a very tall onion, with a ton of moisture inside, and the elephants eat the entire tree! 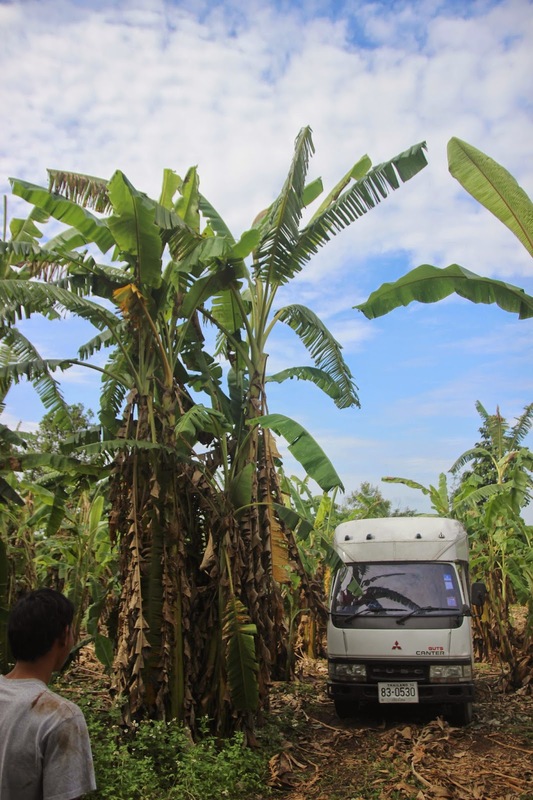 We rode in the back of a large truck out to our destination, then were handed machetes and shown how to chop the trees and which ones to take down. It was incredibly messy, but fun, and it didn't take long before we were told to stop chopping and just carry the trunks and the leaves back to the truck, the water and dirt from the trees covering us in filth. Tor and his friend were our guides for the day, and Ed and I joined them on a spread of banana leaves, enjoying a bit of a break and some snacks before we finished loading the truck. Tor (short for Torza) came to become my favorite of our coordinators - quiet and soft-spoken but very intelligent and aware, he would always smile and say hello - I remember he was the first to learn my name and one of the only people I met on my travels who pegged my exact age immediately (most think I'm much younger than I am). 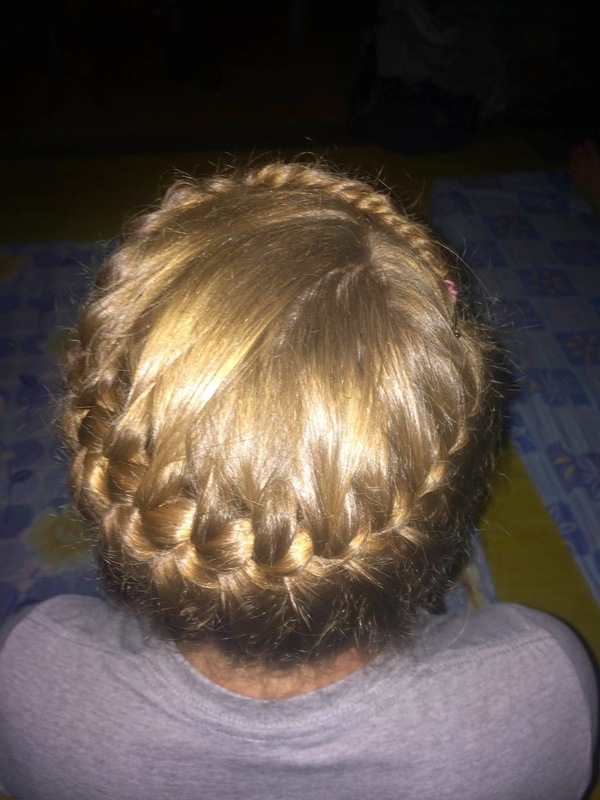 He spoke English well, despite growing up in one of the remote hill-tribes, and he was always a bit shy when we teased him about watching his Thai soap opera each night while we waited for our massages and hair braids. Once we had loaded up the original truck, we piled into the a separate pickup truck for an early return to the park. 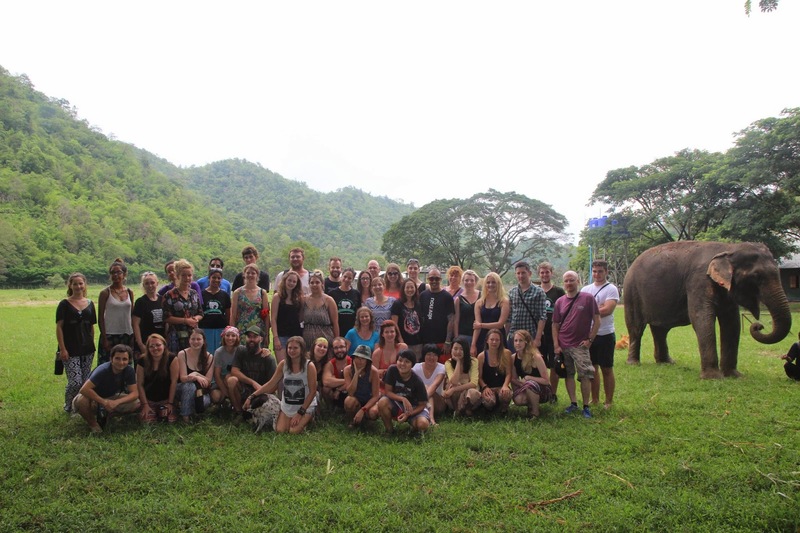 After cleaning up and having lunch, we gathered out in one of the fields to have our group photo taken with a couple of the elephants. I handed Tor my camera and he started running around taking photos of *everyone* after the group photo was finished up! Following the photo, we had a bit of time to hang out on the porch and watch the elephants, getting to join in on the feeding a bit. At one point, Jenny, Ed, and I were recruited to help unload a truck full of moldy pumpkins - so much for being clean and dressed nicely! We had a small assembly line going, tossing, catching, placing in baskets, dragging full baskets to shelves, unloading onto shelves. 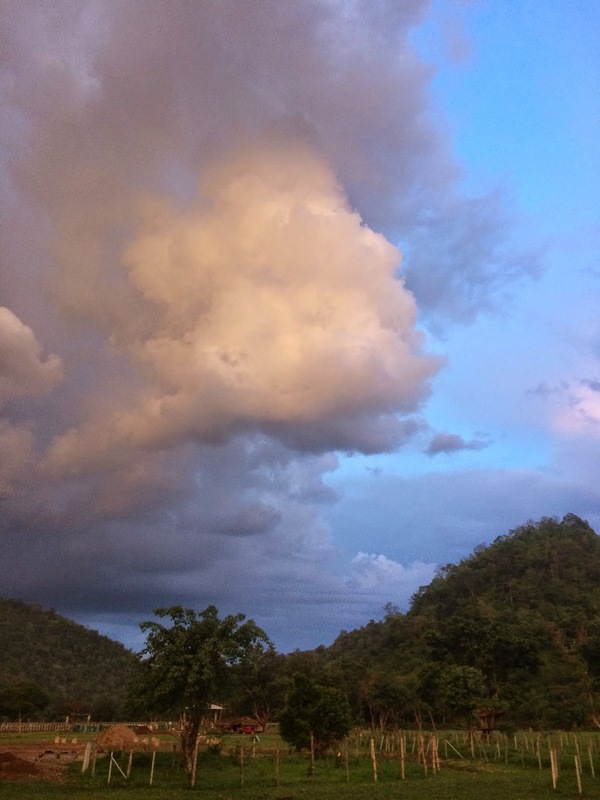 Finally we finished up and got to hang out and watch the elephants - and make a quick run to a store outside the park for some rum - before our farewell dinner. As a special farewell, they had placed small tables, surrounded by four cushions on the floor, all around the upstairs area of the pavilion. They had a small stage area set up, and after Tor had given us descriptions of the various dishes at our table, we began our meal. 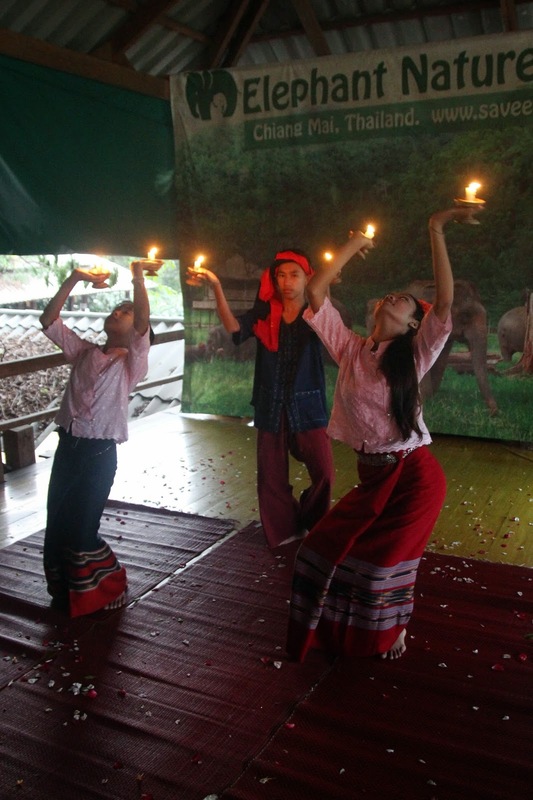 As we ate, the children from the school we had visited came out to give traditional dance performances. The food was a tasty and welcome change from our nightly buffet, and watching the kids dancing was pretty amazing. Once the celebration had wrapped up, a few of us combined our little tables, sharing rum and moonshine and chatting until it was finally time to retire to bed. Our final day, up early for breakfast, many feet dragging, there were only a few jobs for the groups to share: poo, food, and dog walking. The vast majority of us didn't make it anywhere immediately though. Just after breakfast, we had a convergence of two elephant families right in front of us. 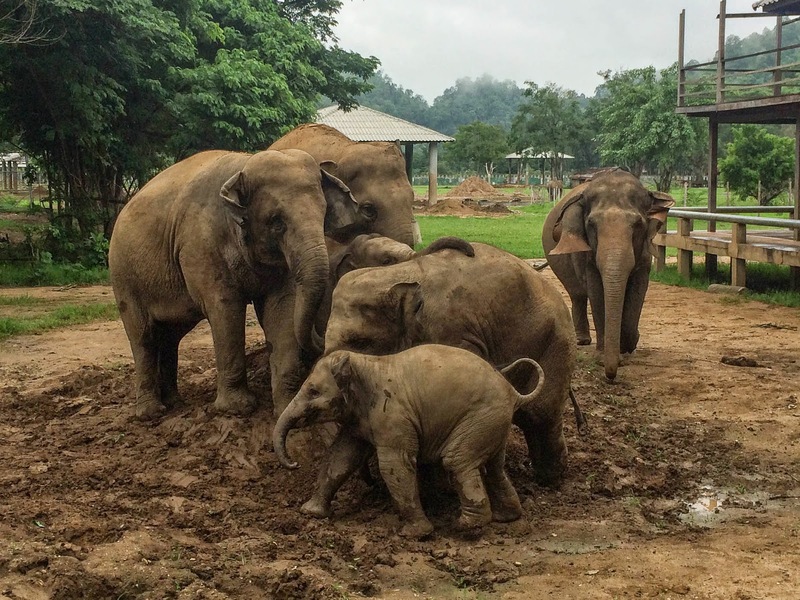 One was the large family that included Dok Mai and Faa Mae, then another family with another baby in tow arrived, and everyone began playing in a mud pile together! 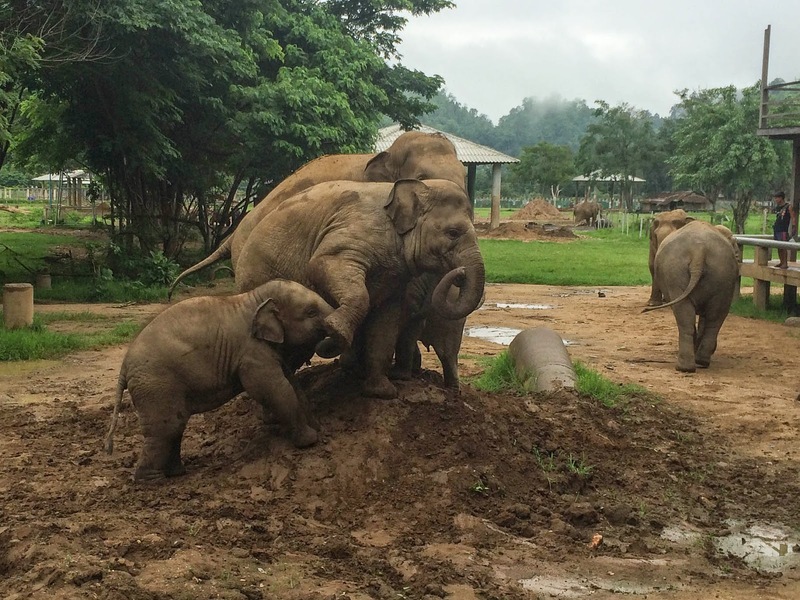 The babies and Faa Mae were all over the place, rolling, running around, up and down the pile of mud, playing, the babies crawling up onto other elephants. 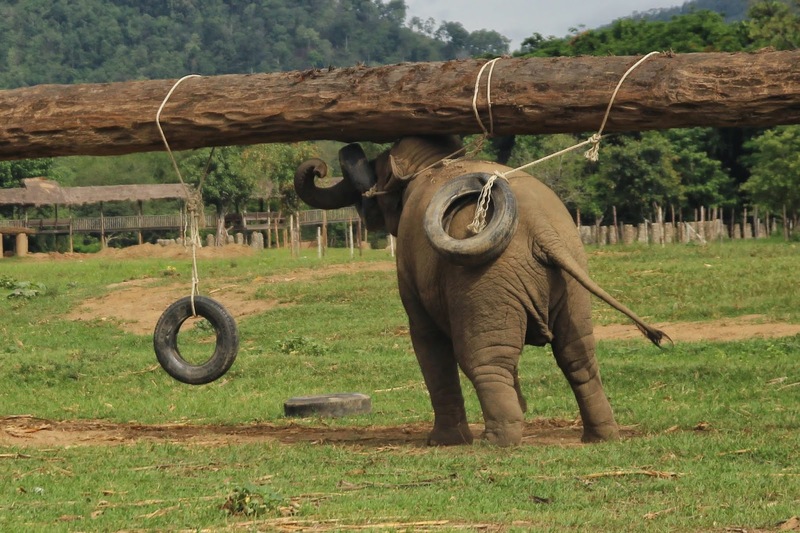 All of this while one other elephant - a circus rescue - went up on her hind legs to pull leaves from a tree over the pavilion! 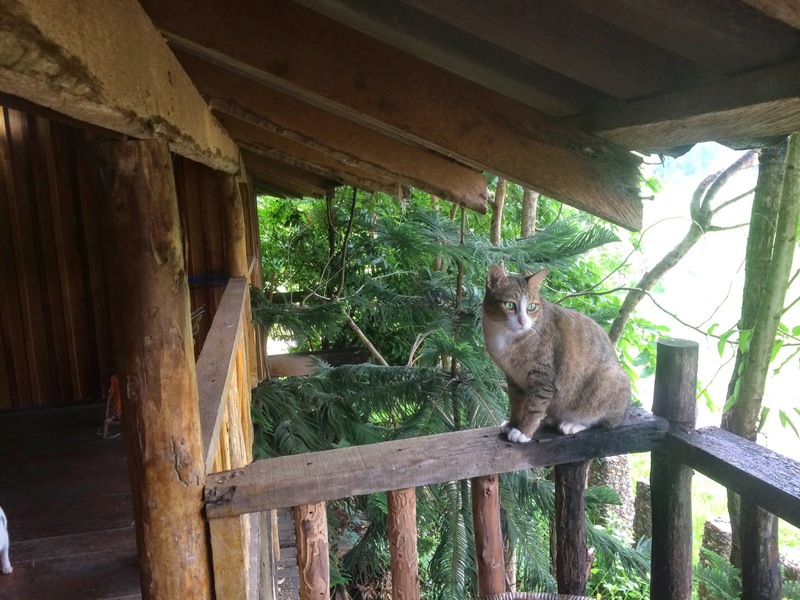 A couple of times she put her enormous front feet up onto the pavilion itself - so much for the railing! Sadly, I never got that chance. On July 2, Torza Montri was struck by a truck while riding his motorcycle. 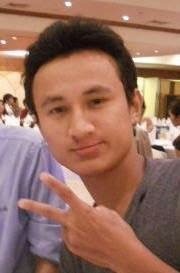 We received word about a week later that he had passed away as a result of injuries from the accident. He was a wonderful person who carried a smile and a quiet strength, and who was such an integral part of the volunteer experience for each of us. 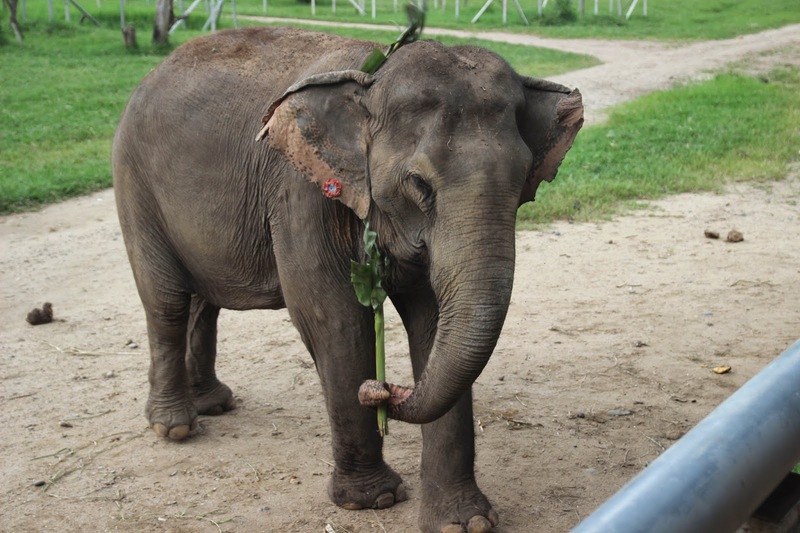 Thank you, Tor, for everything - your presence will be dearly missed at Elephant Nature Park. *Sadly, I didn't have any photos of my own of Tor - these are from Facebook.